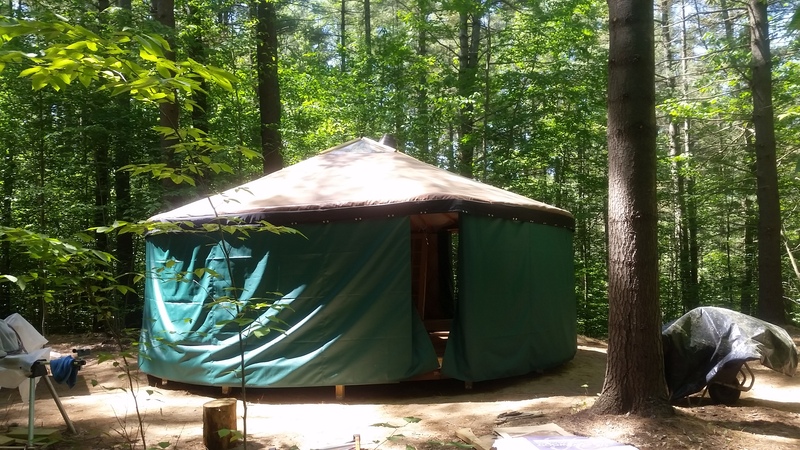 For a few years now, Mike Mabunay has been building his camp in the town of Greig, a small township in the Adirondacks of upstate New York. 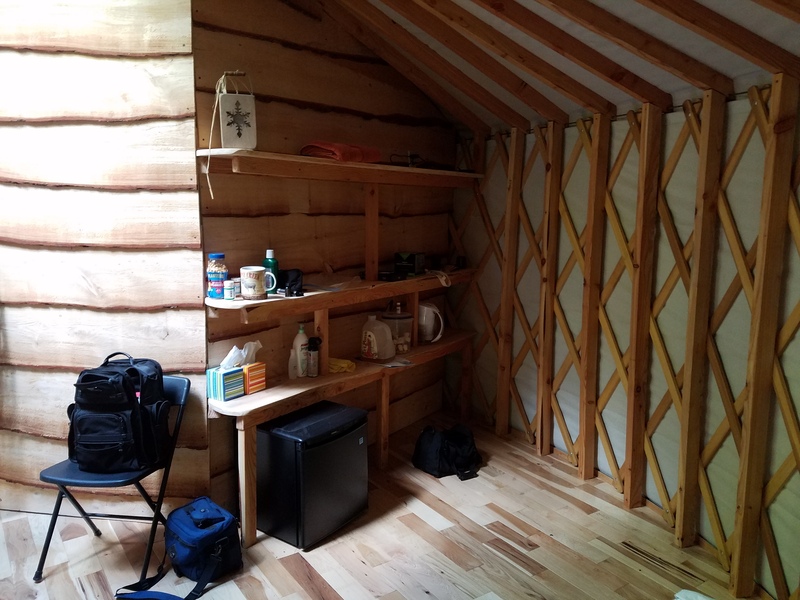 His off-grid cabin was recently featured in Cabin Living Magazine. 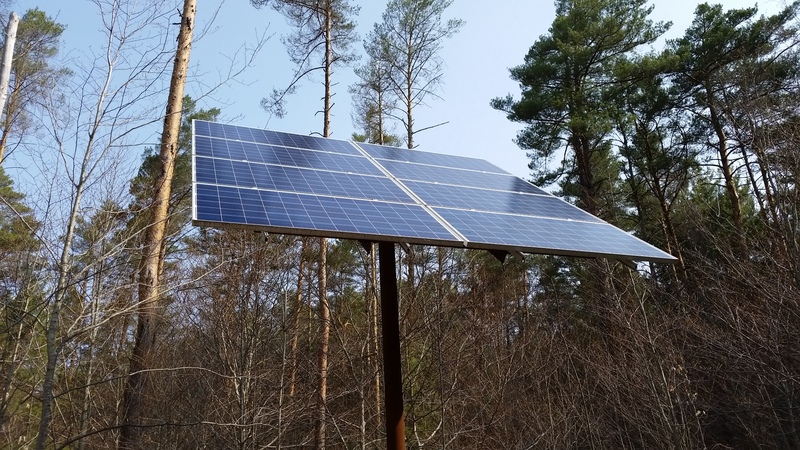 The entire camp is powered by solar with a backup propane generator for those cloudy North country Fall and Winter seasons generated by Lake Ontario. 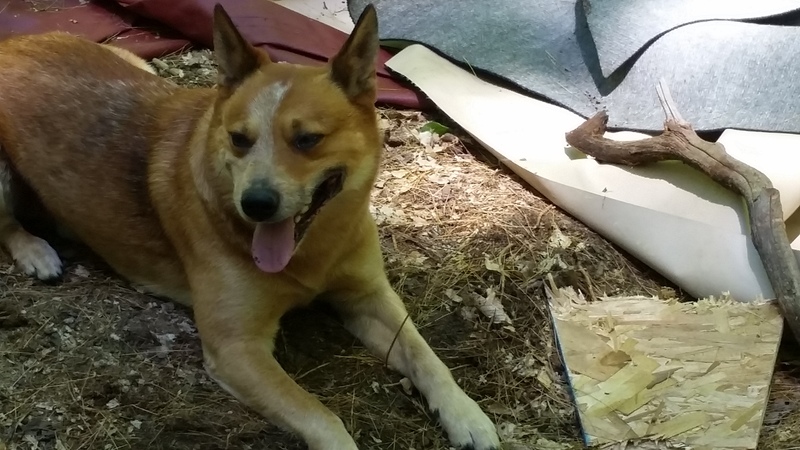 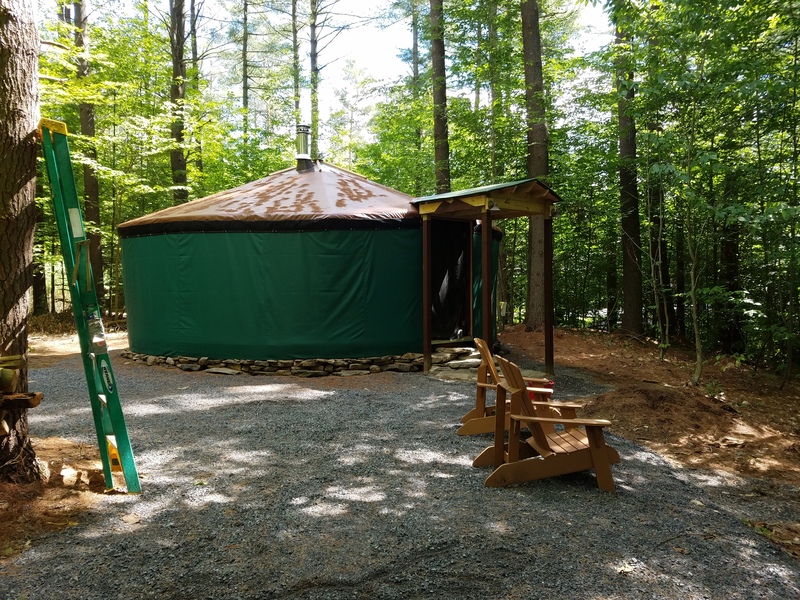 He and his wife Sylvia recently decided they wanted to add a yurt to the property. 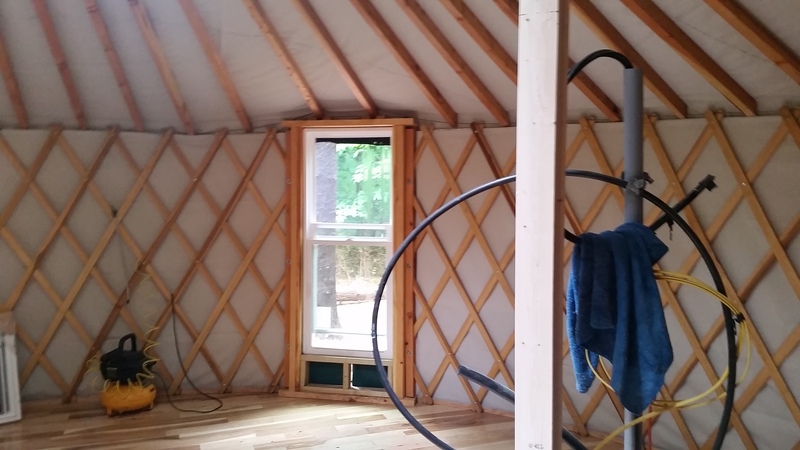 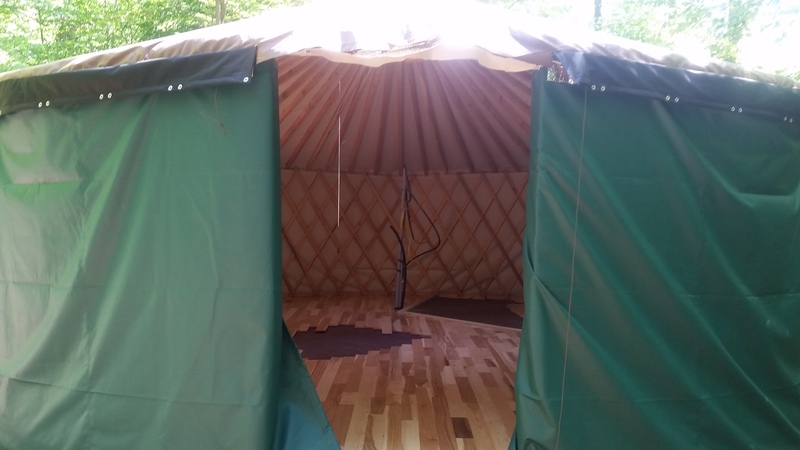 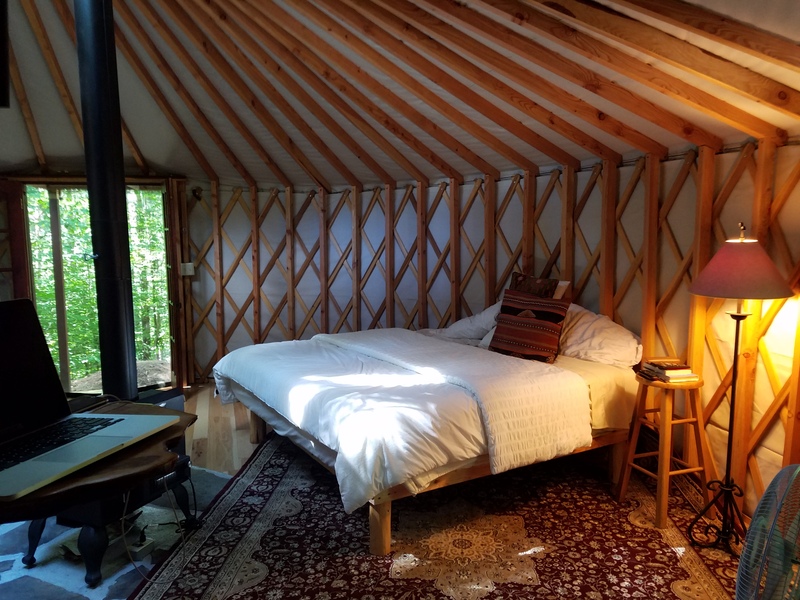 The main idea was to use it for some additional living space and of course, for the yurt experience. 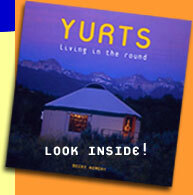 Mike did his research and after reading our article ‘A Visit to Surely Yurts‘, he went and visited Steve Reeds shop. 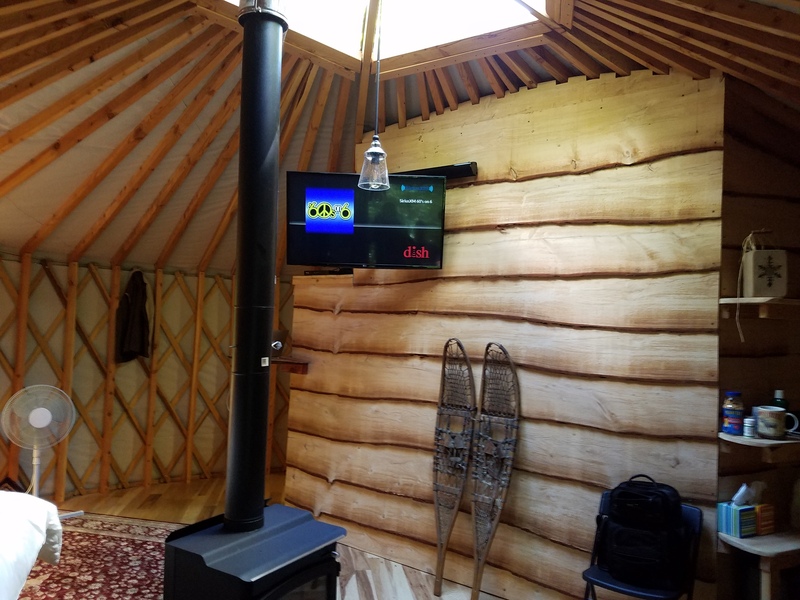 Apparently the visit went well because shortly afterwards, Mike contracted for a new 24′ yurt from Surely Yurts. 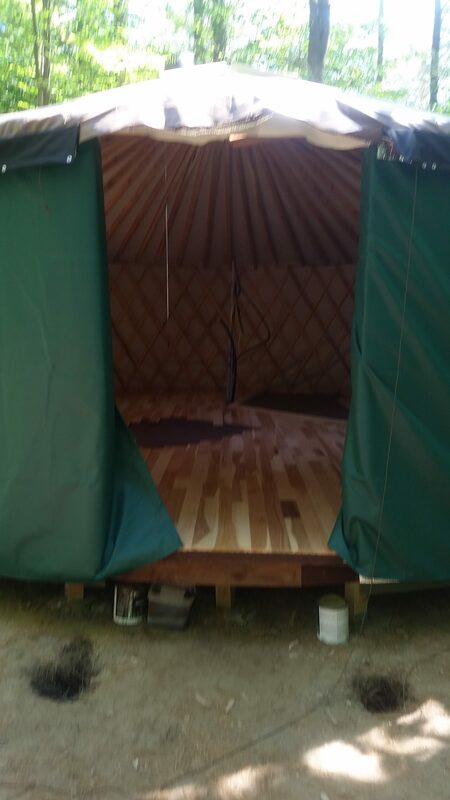 This however, was not going to be a normal yurt build. 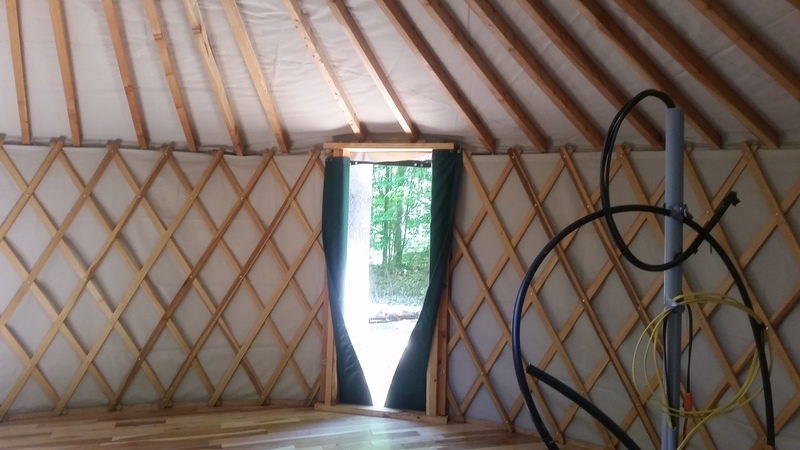 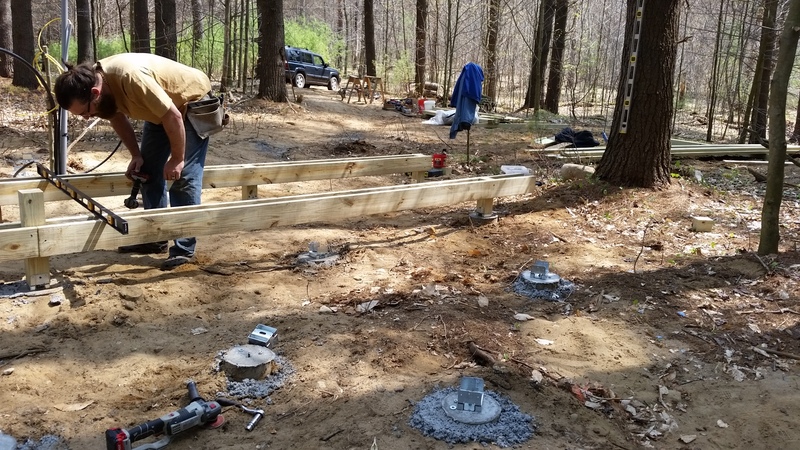 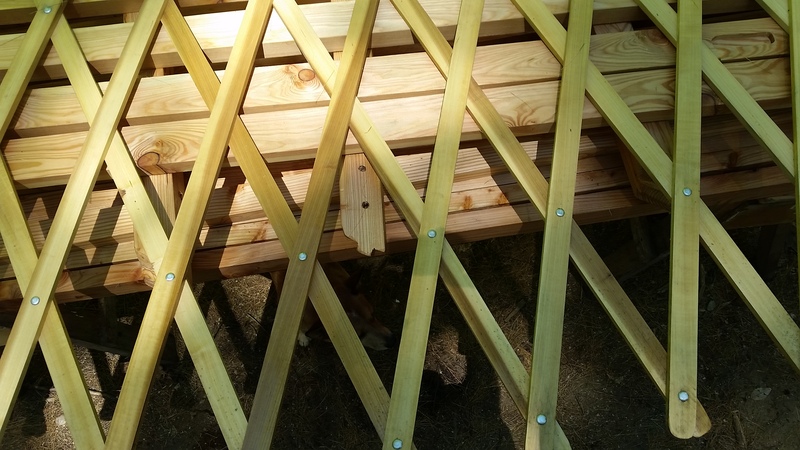 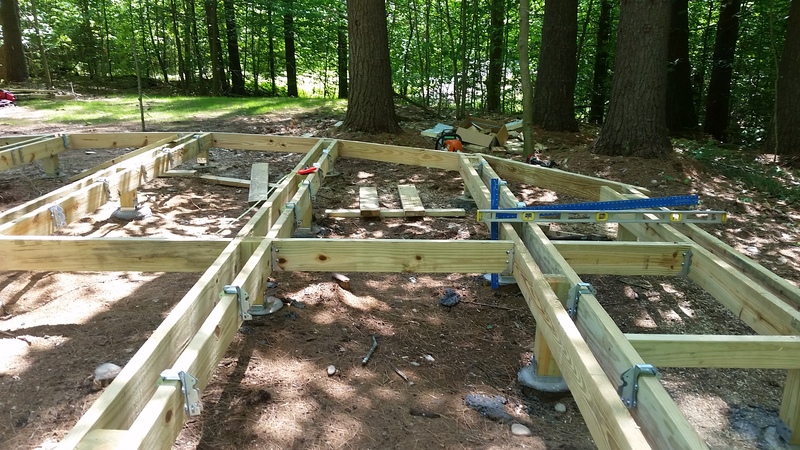 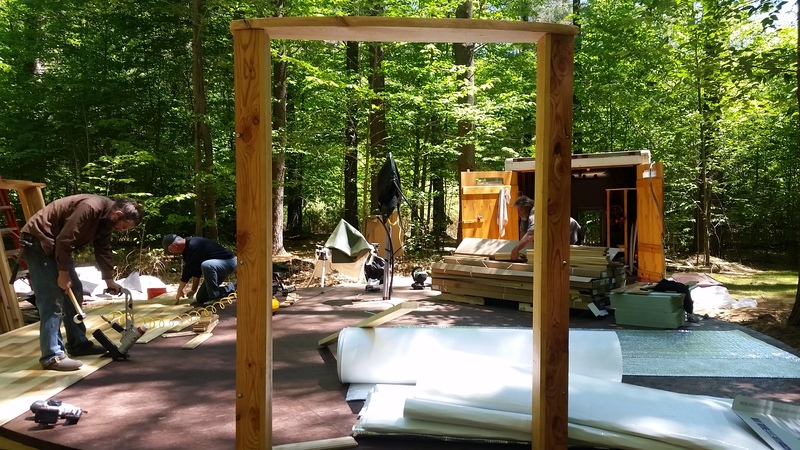 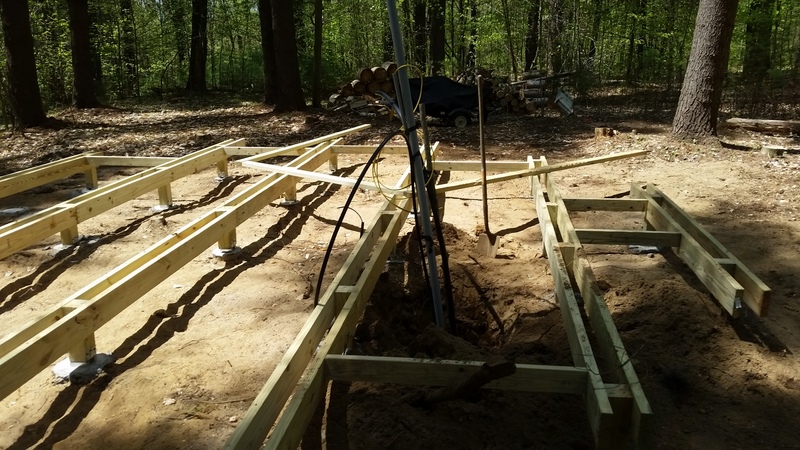 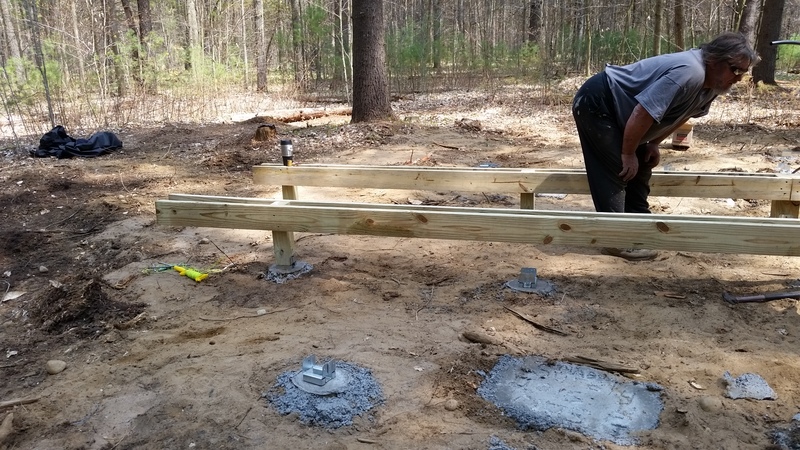 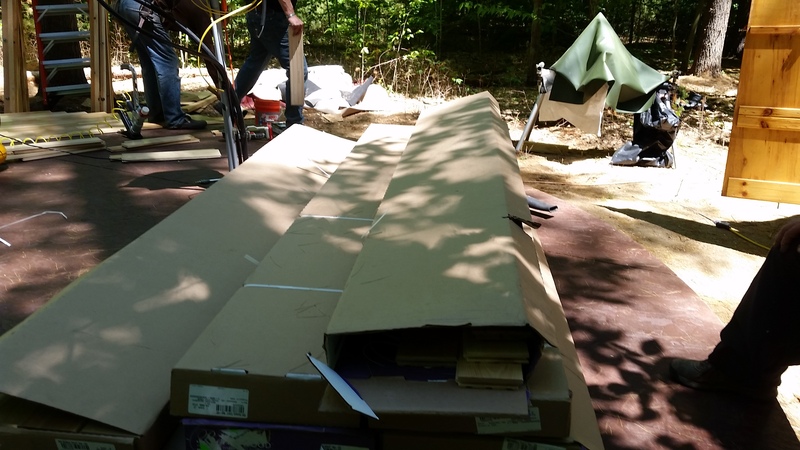 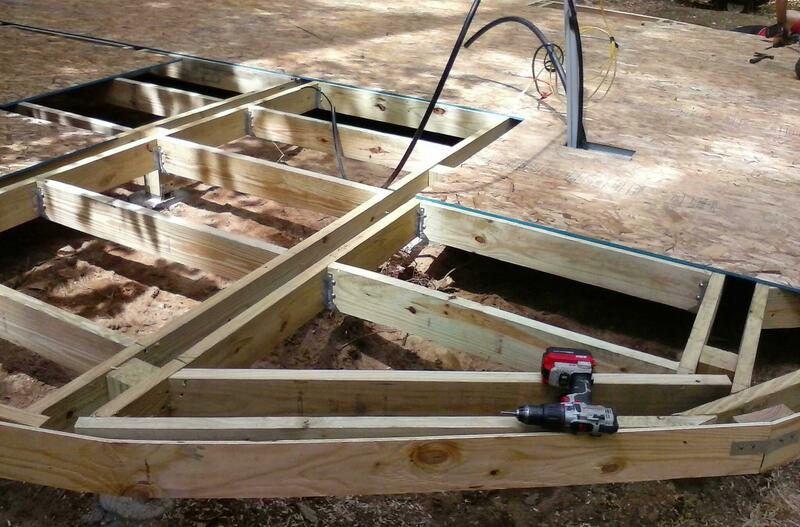 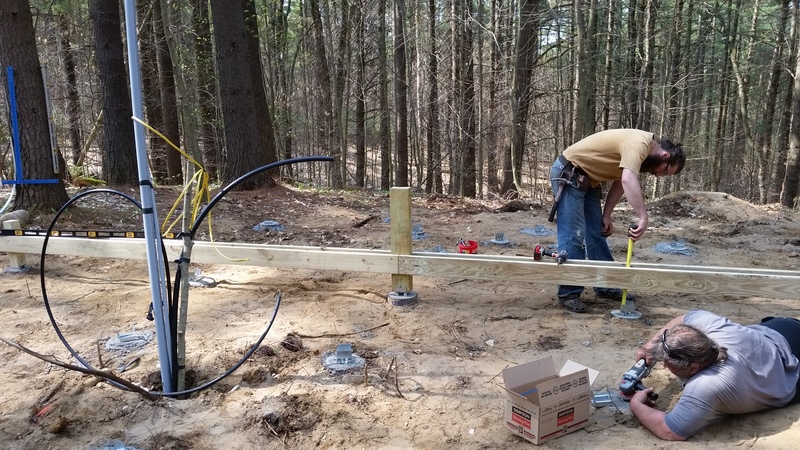 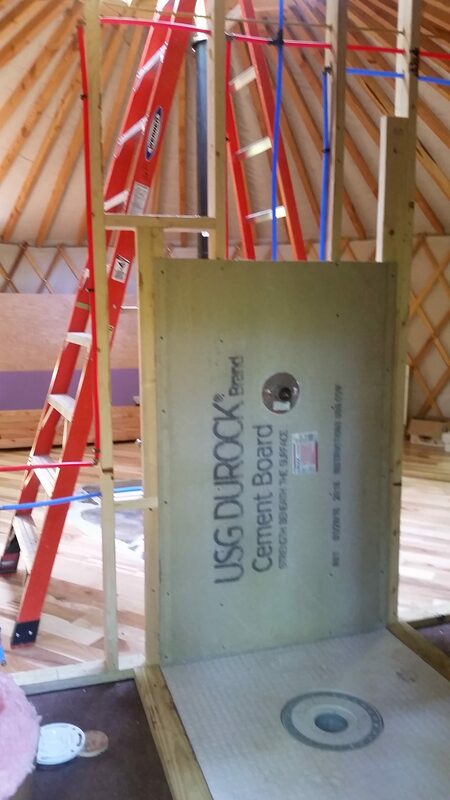 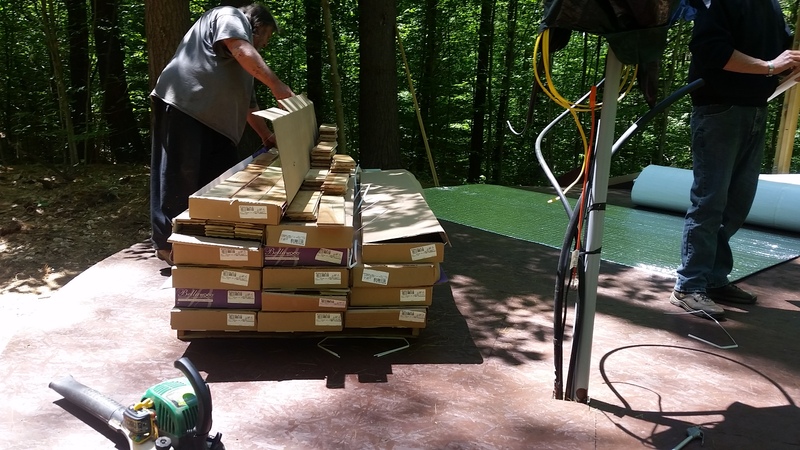 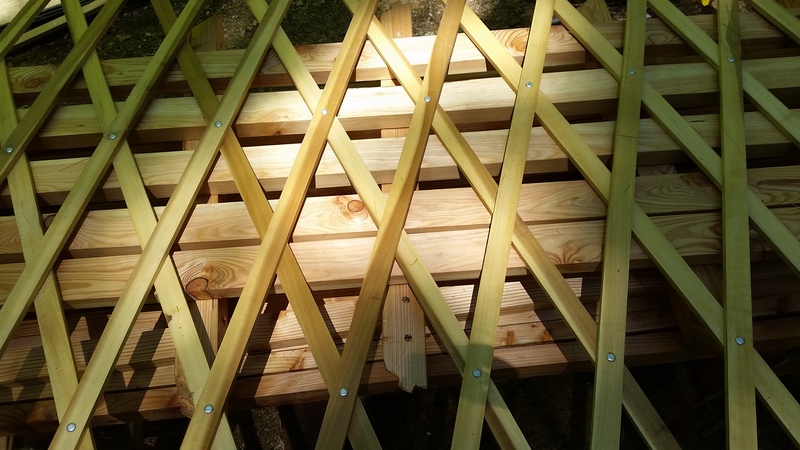 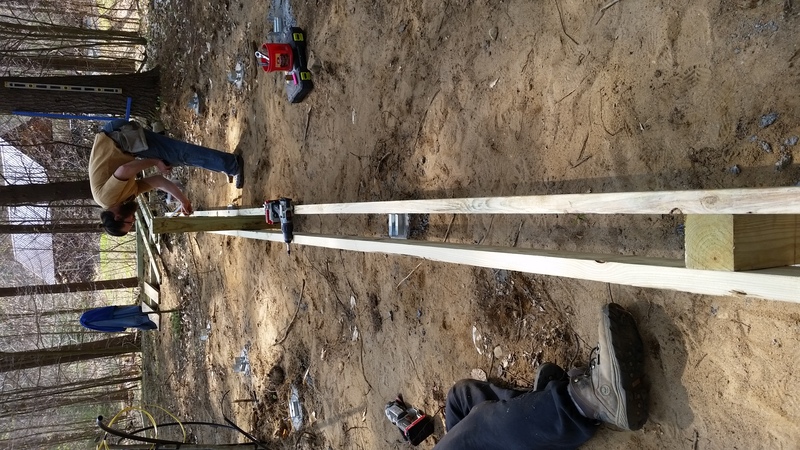 “Normally we just build the platform, set up the yurt and leave for the next build.” said Steve Reed. 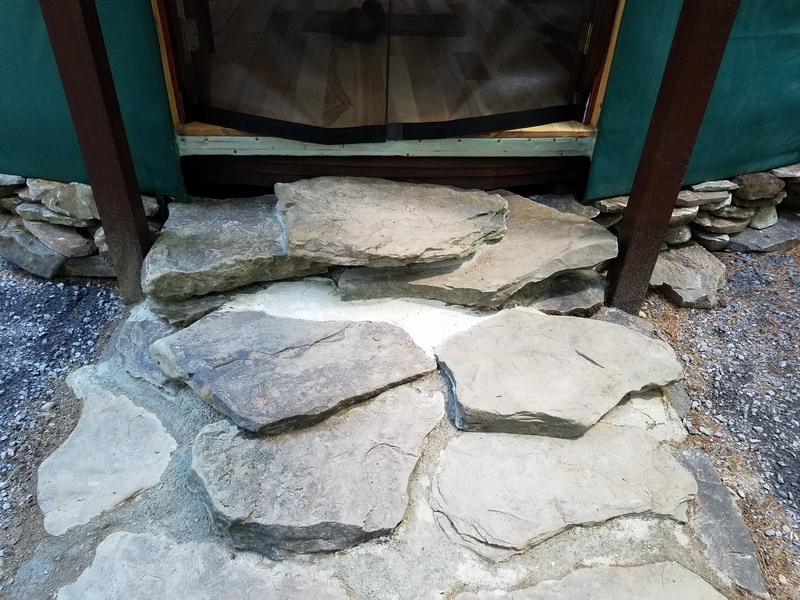 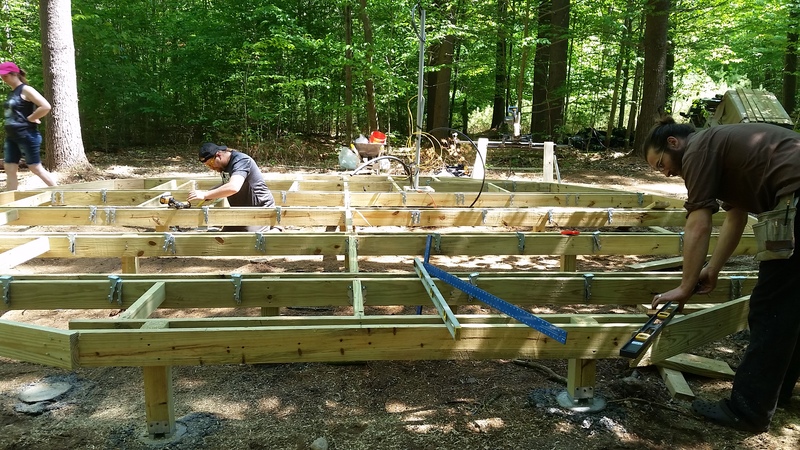 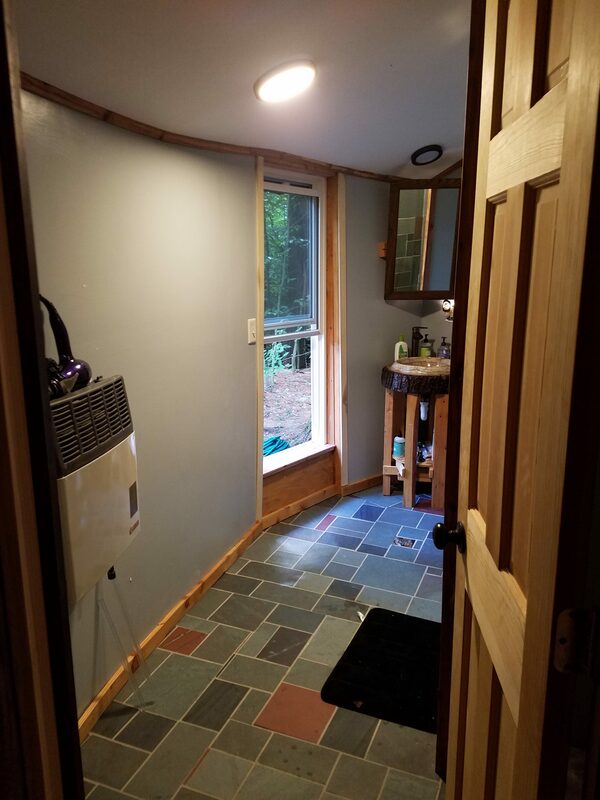 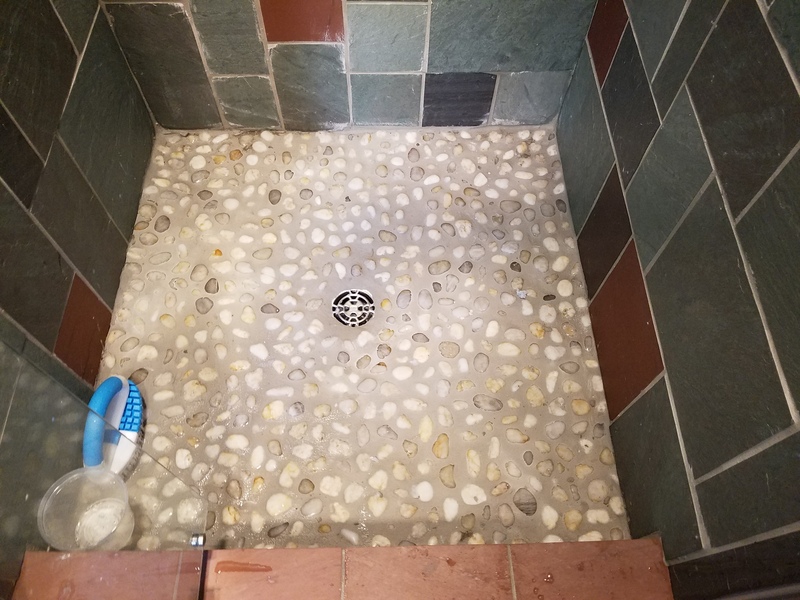 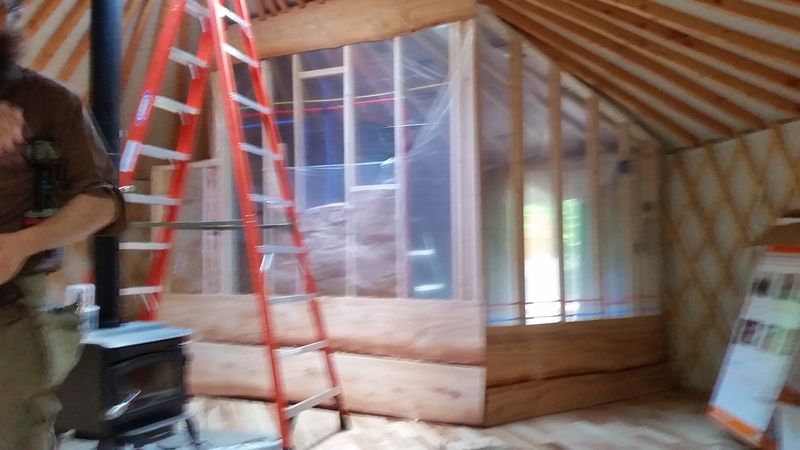 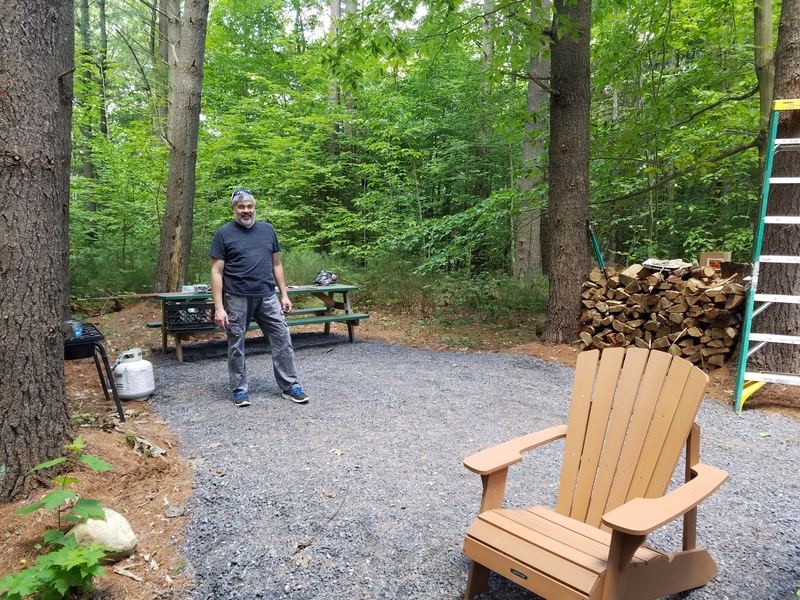 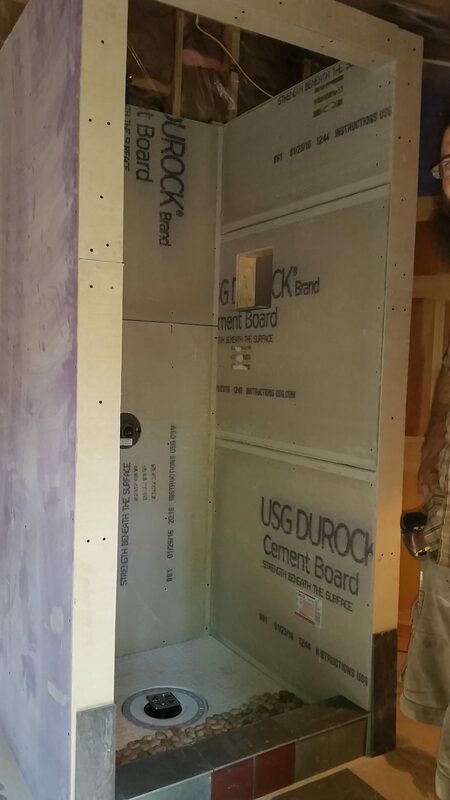 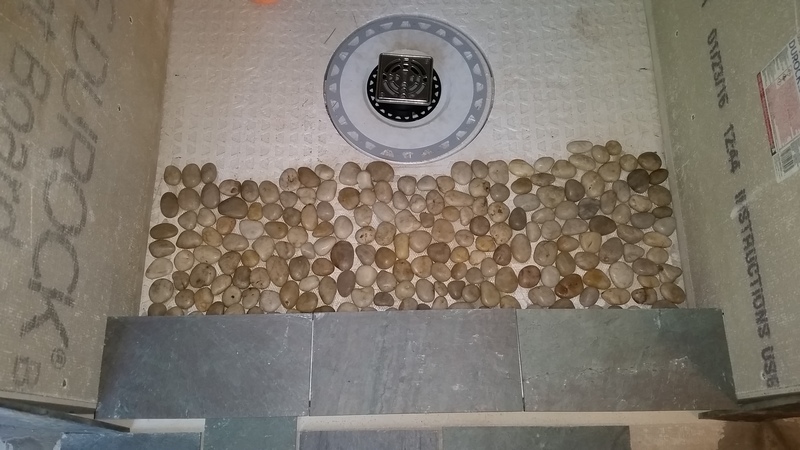 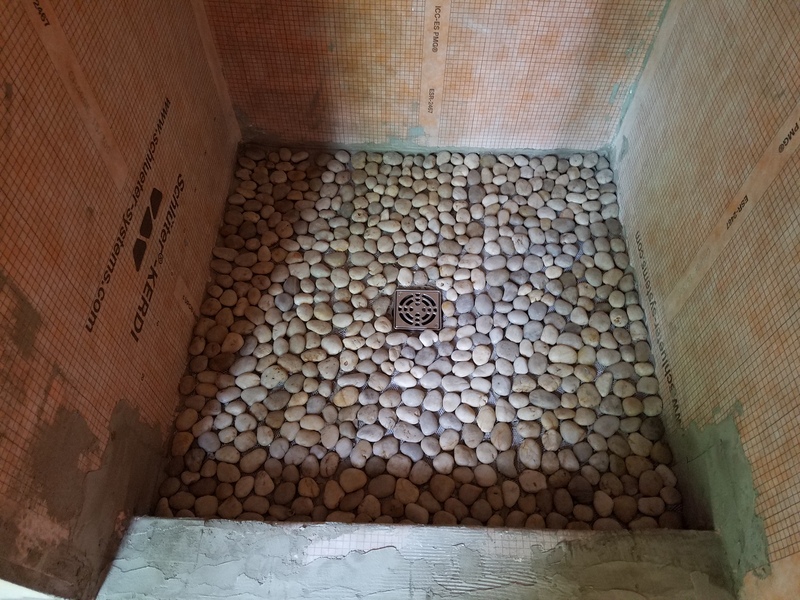 Mike changed things up a bit by also hiring Steve to do much of the interior projects, such as adding a full bath, hickory flooring, plumbing, deck, perimeter stonework, rustic walls, a hearth and hours of trim work. 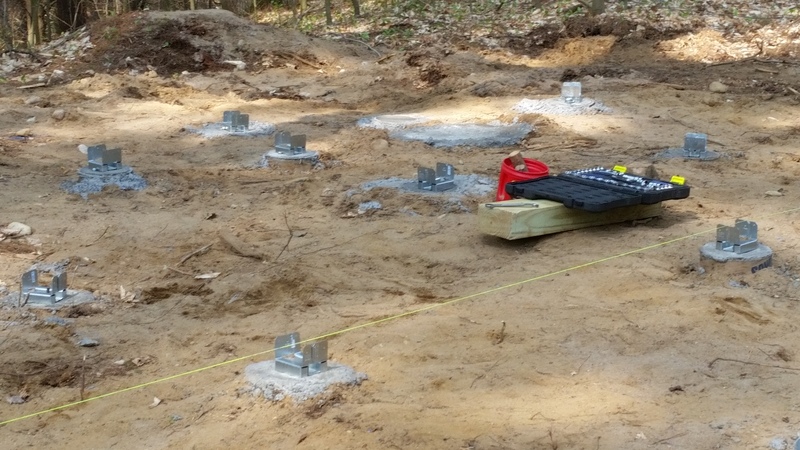 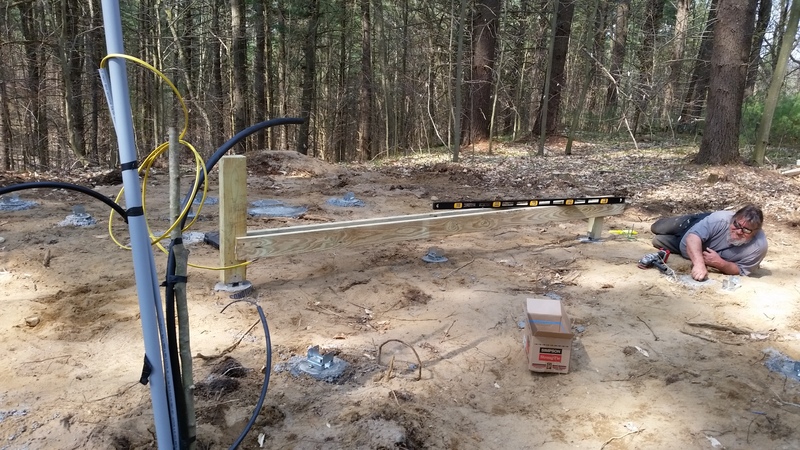 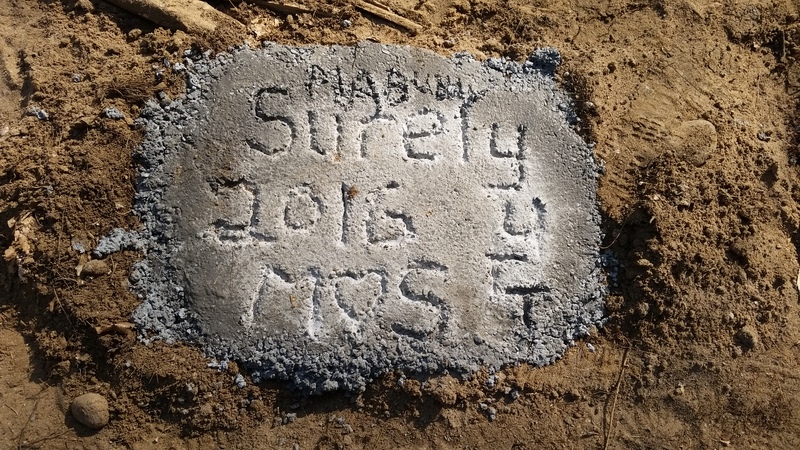 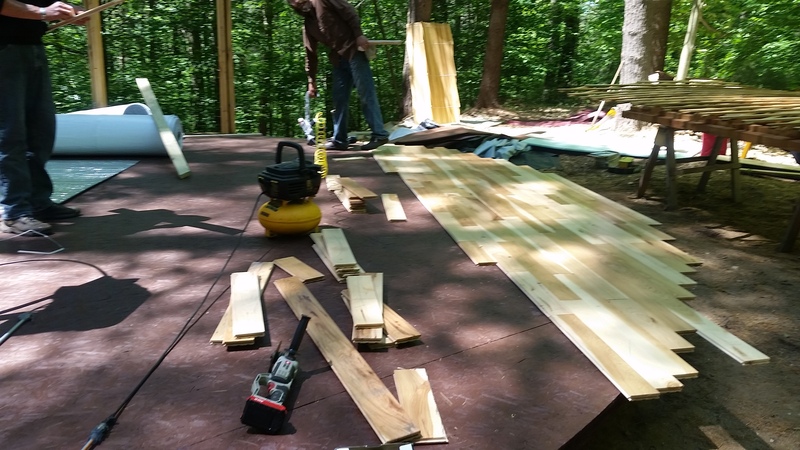 Since the location was not far from my residence, I frequently visited Mike and Steve throughout the build process. 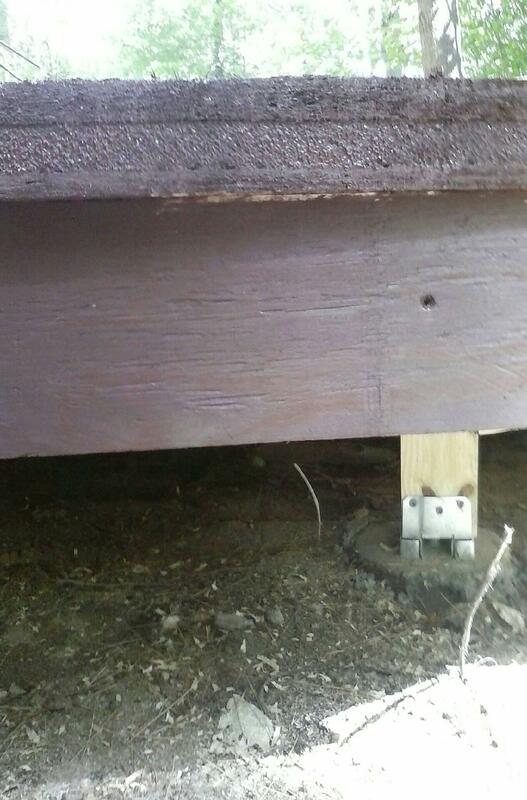 There were many hands in this project and it was done under the approval of the local code enforcement officer. 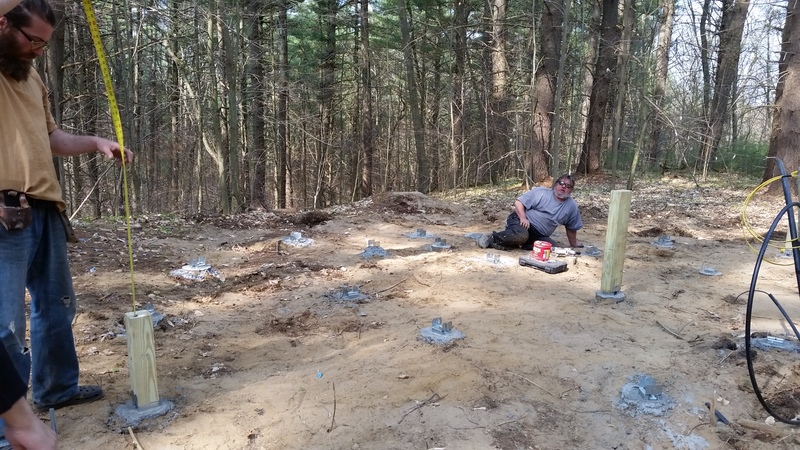 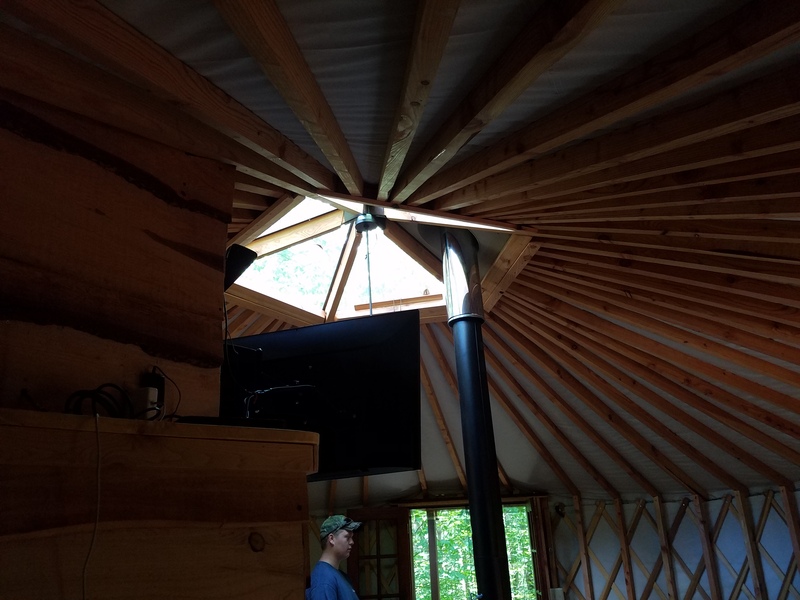 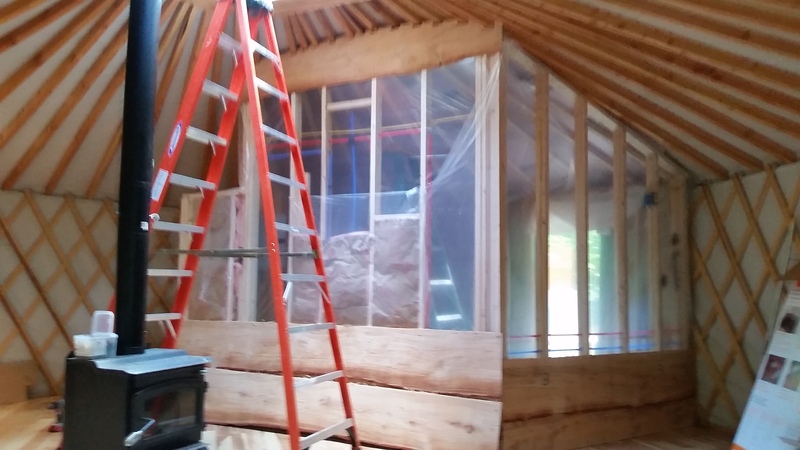 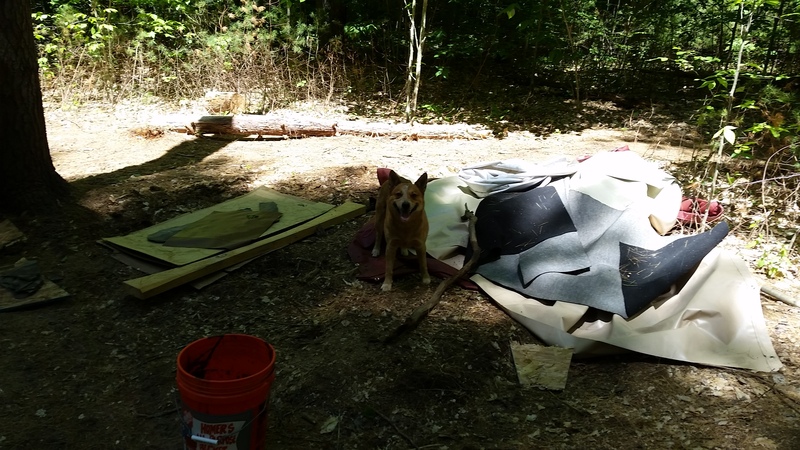 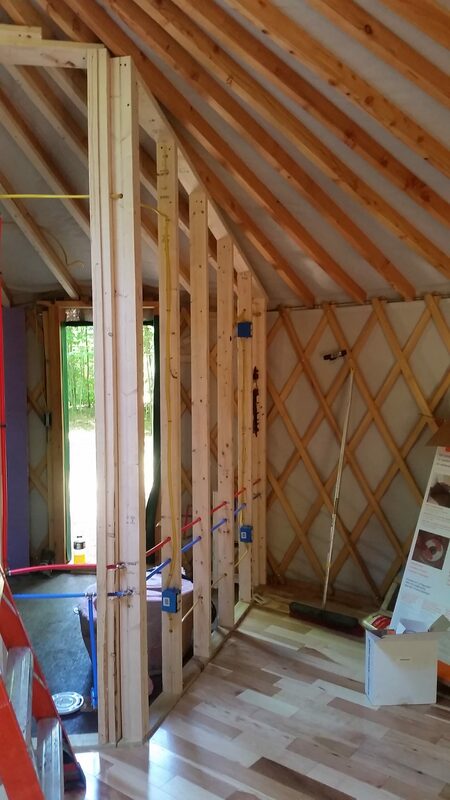 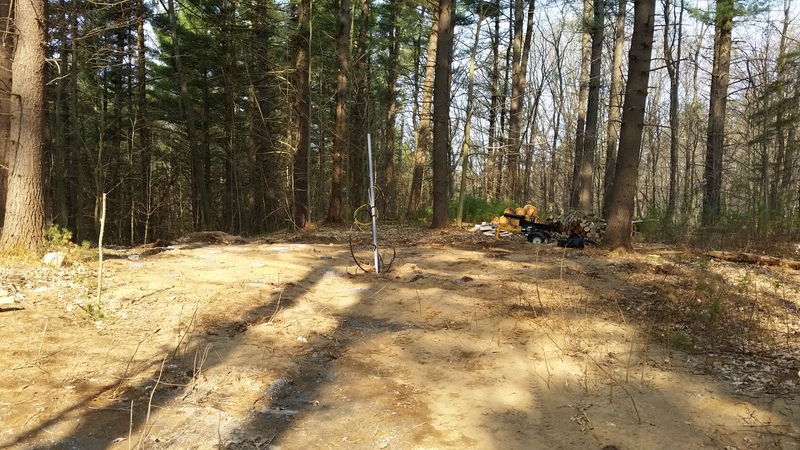 Seeing as how building codes are often a topic on the Yurt Forum, I was very pleased to be there one day when David Meade, the Town of Greig code enforcement officer was visiting the job site. 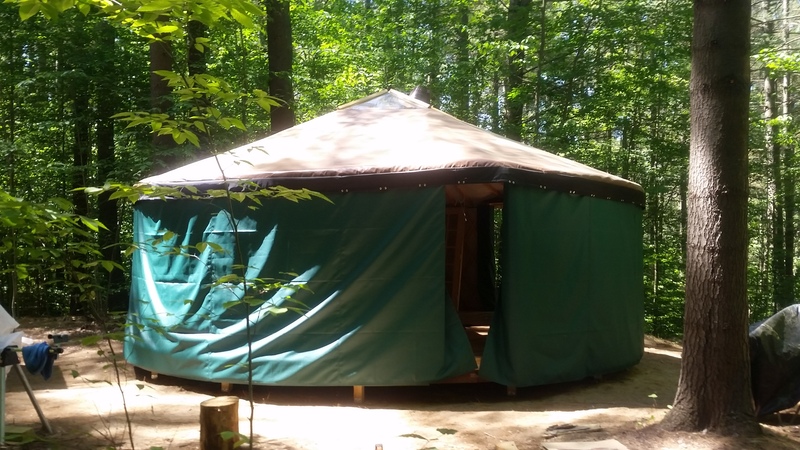 I asked David what his number one concern was when he was approached to permit the yurt. 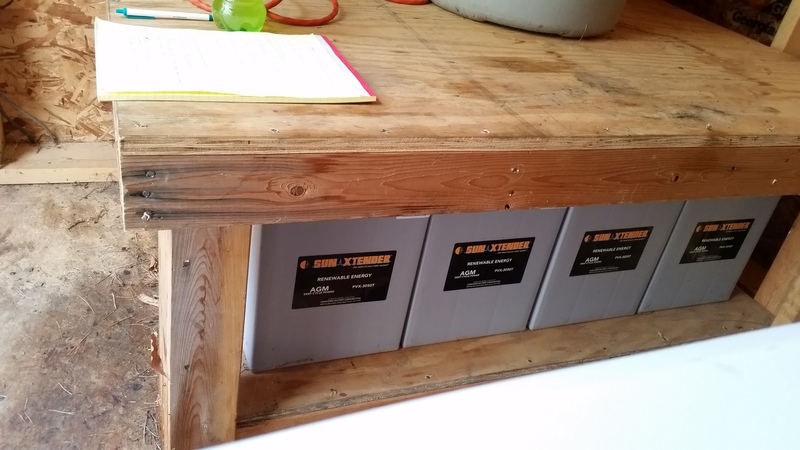 “Snow load, first and foremost” he said. 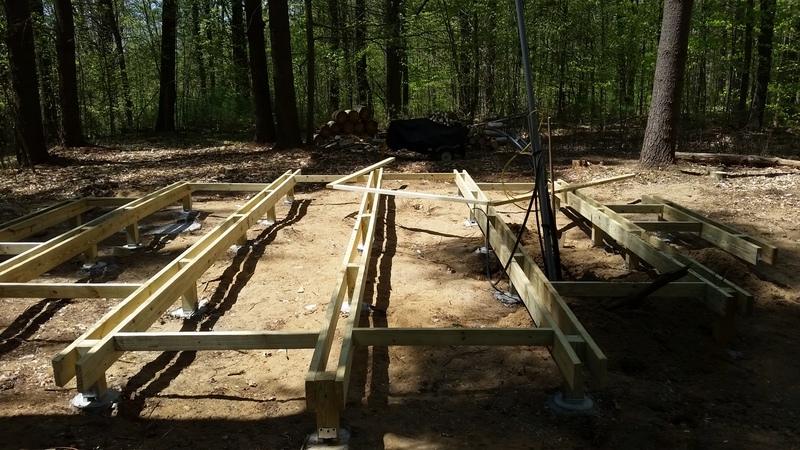 The local ordinance requires a snow load capability of 85 PSF (Pounds Per Square Foot), so he had to ensure that the stamped plans indeed illustrated that from the roof to the platform, snow load would not be an issue. 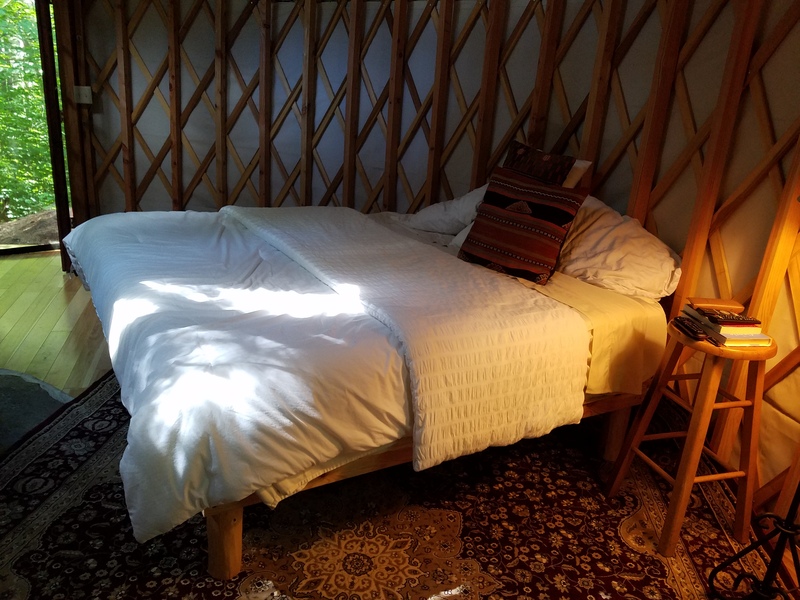 Otherwise he said “since it is not a residence and that it is off-grid” there were not too many other rules to worry about. 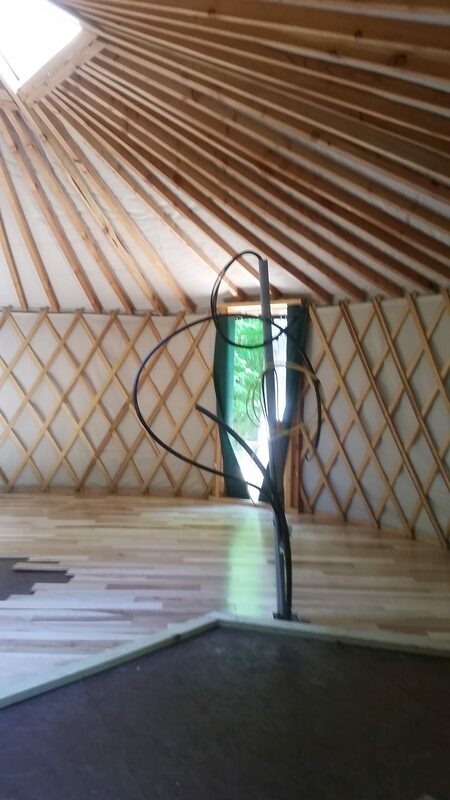 The yurt does have plumbing and electric (from the solar array), but there was nothing about a yurt that would change the standard code for those things. 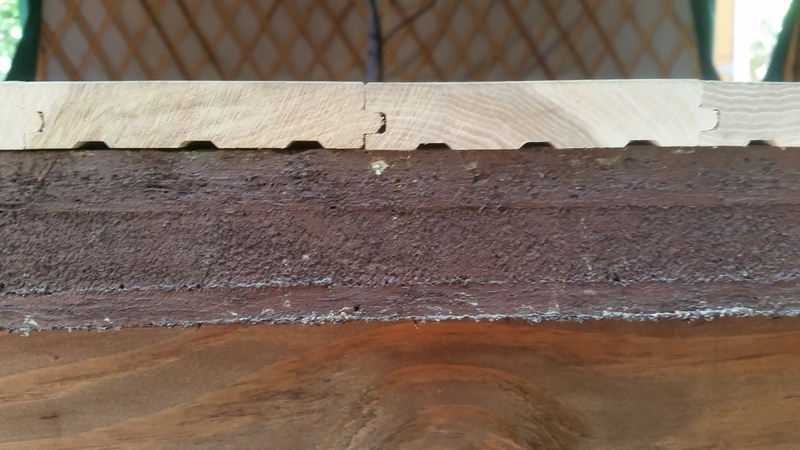 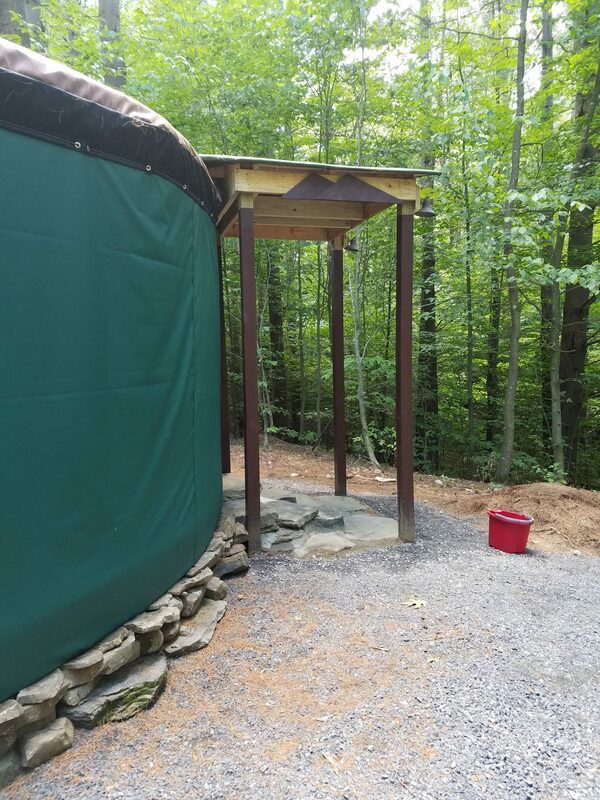 The bathroom in the yurt uses a brand new leech field, which also had to be inspected. 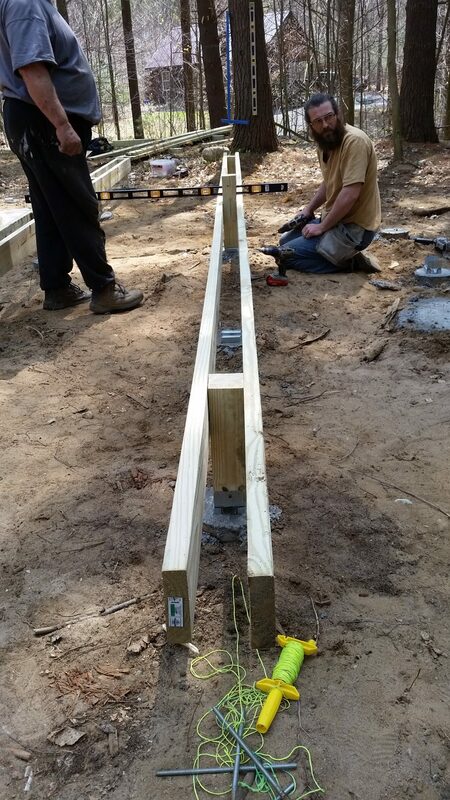 All in all, the inspection process was rather easy going. 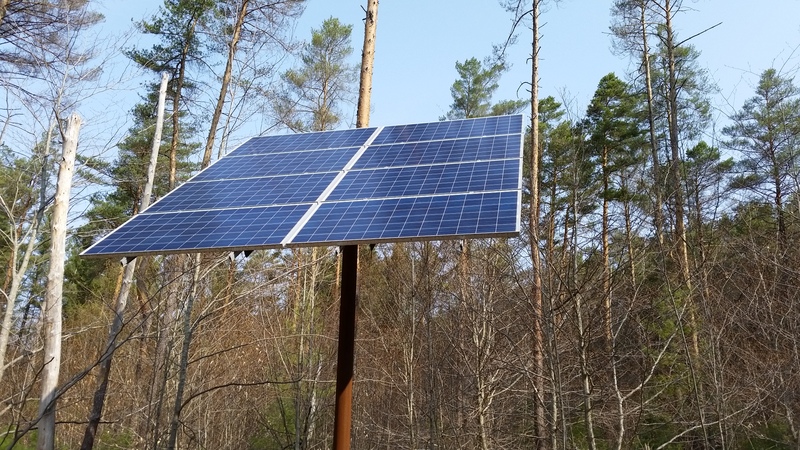 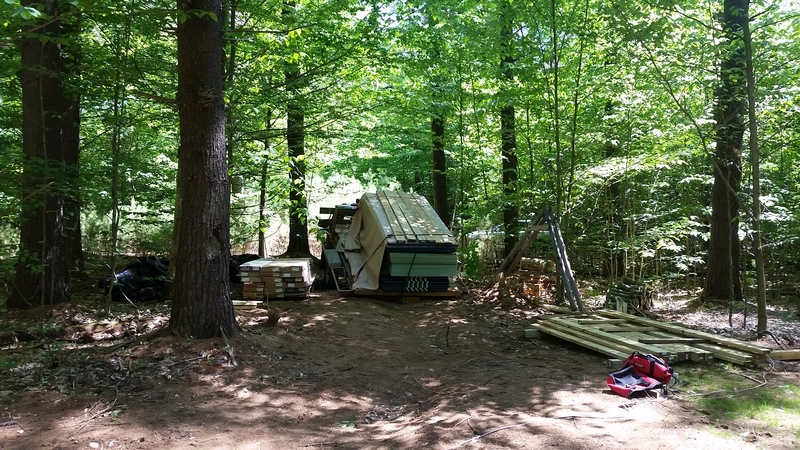 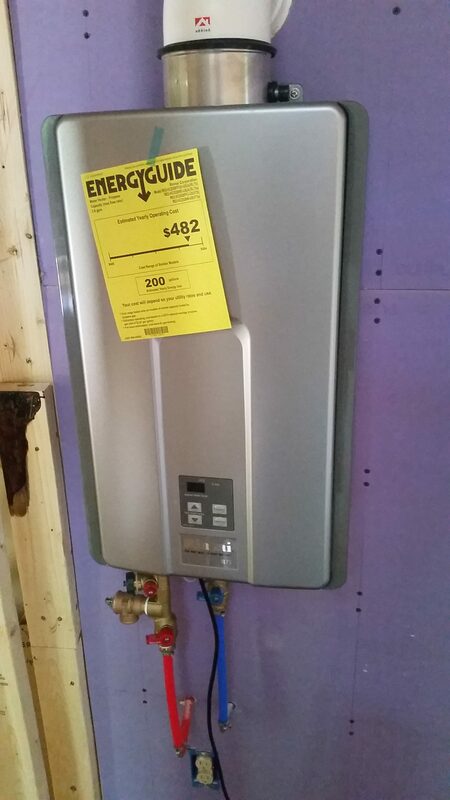 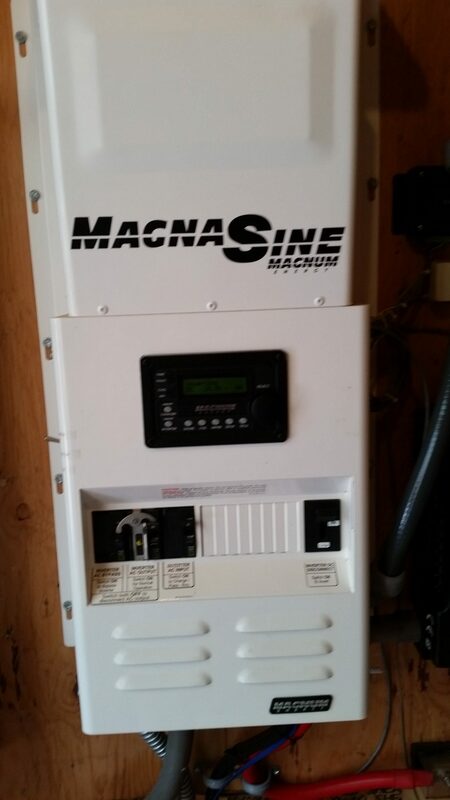 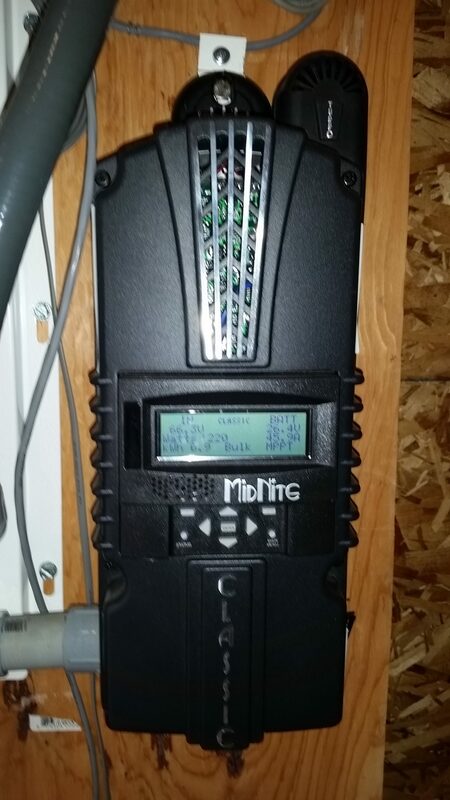 Mike currently has an impressive 2.4 kW solar array complete with battery bank, inverter, full 240 volts available and a propane backup generator to power his cabin. 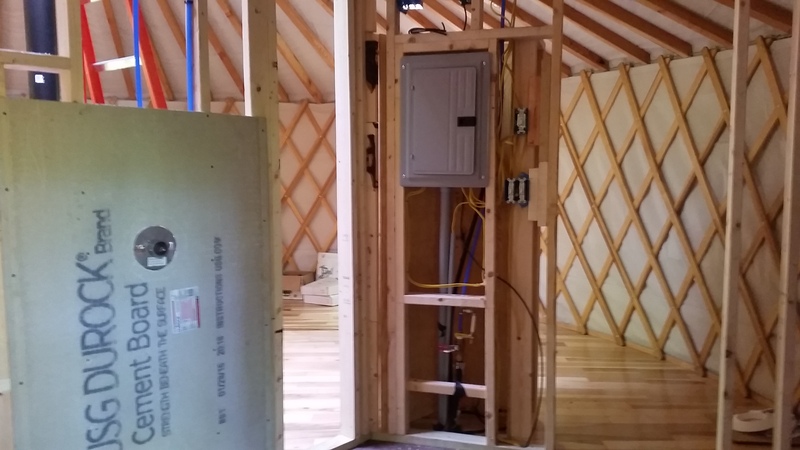 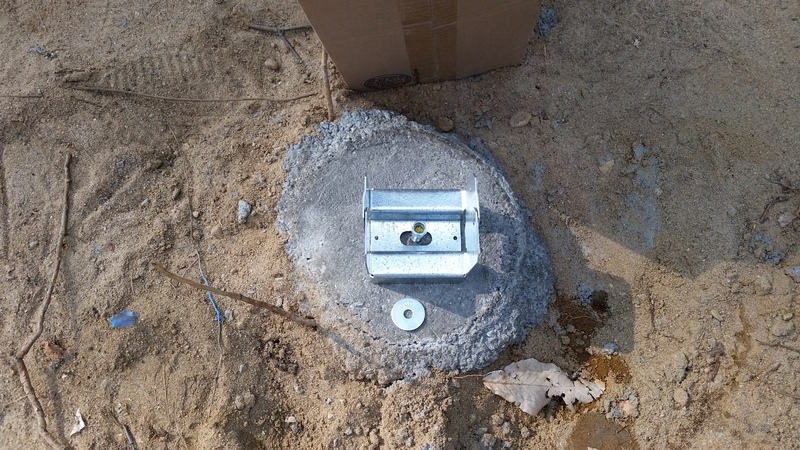 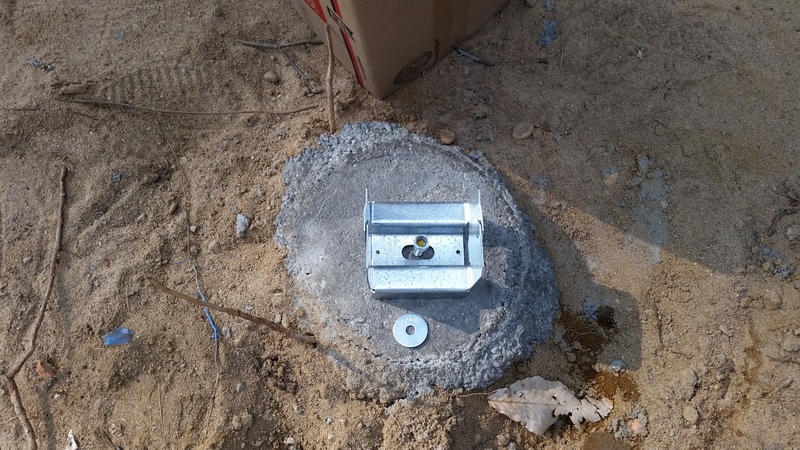 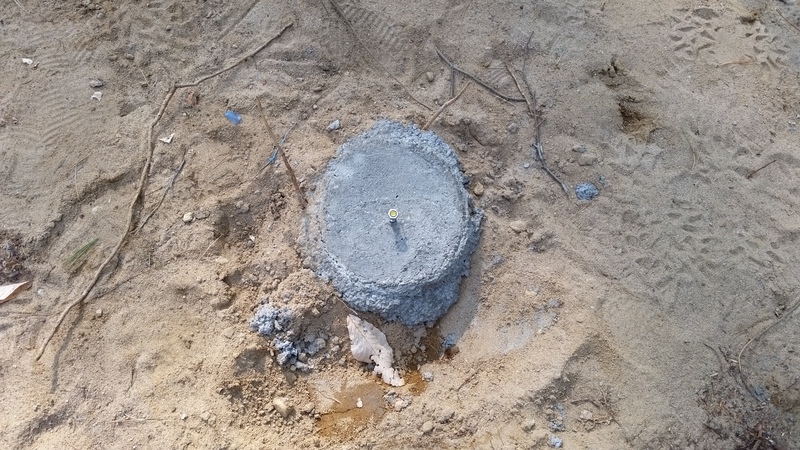 The yurt will be tapping power from this source. 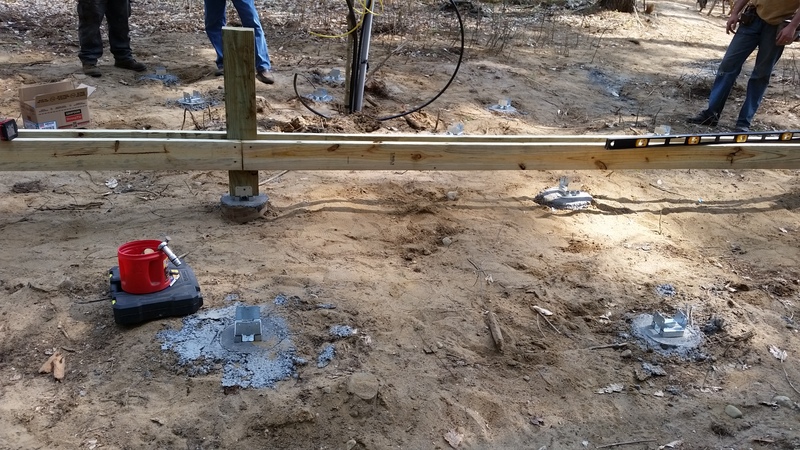 One of the nice parts of this particular build is that the ground is very sandy. 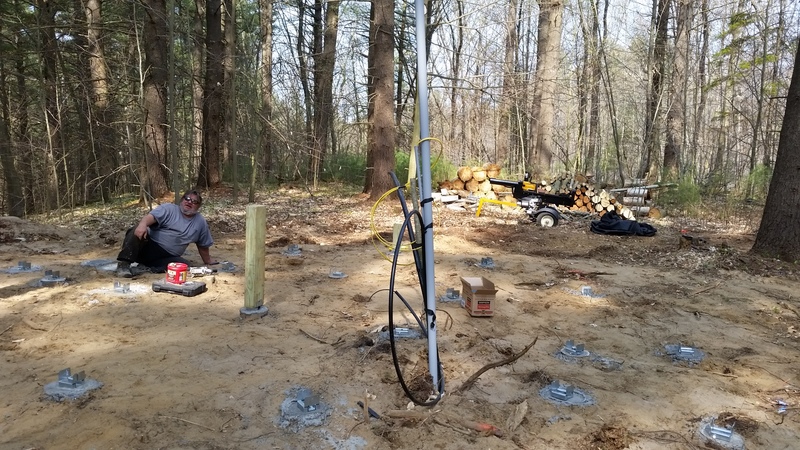 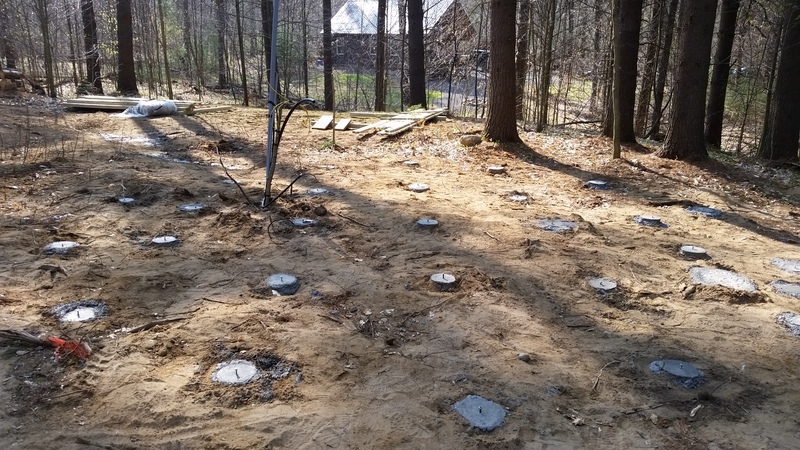 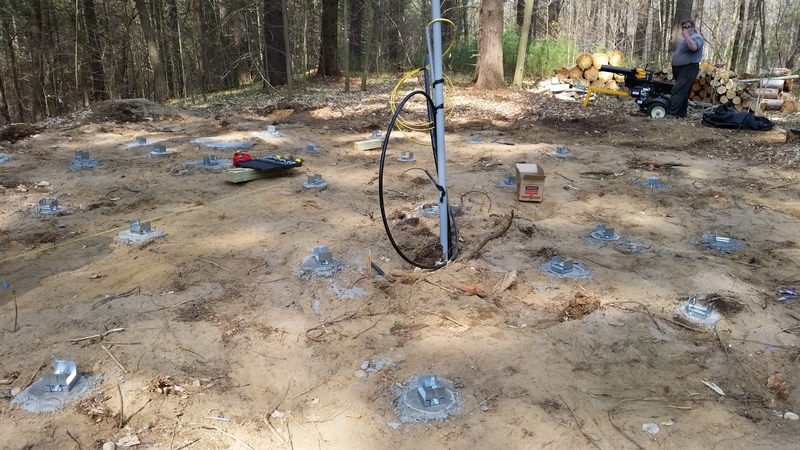 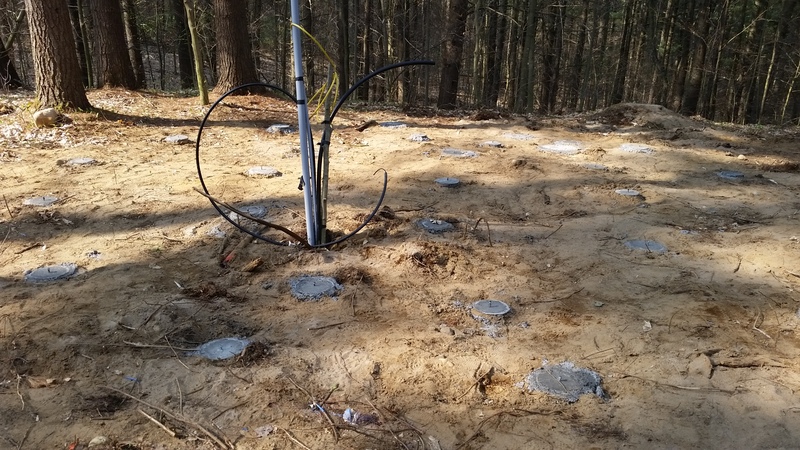 Putting in the sonotubes and trenching for plumbing and electric was a piece of cake compared to other soil types. 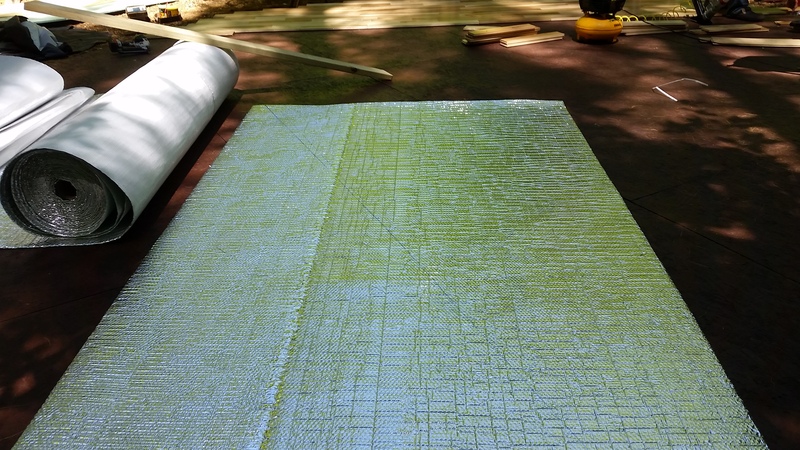 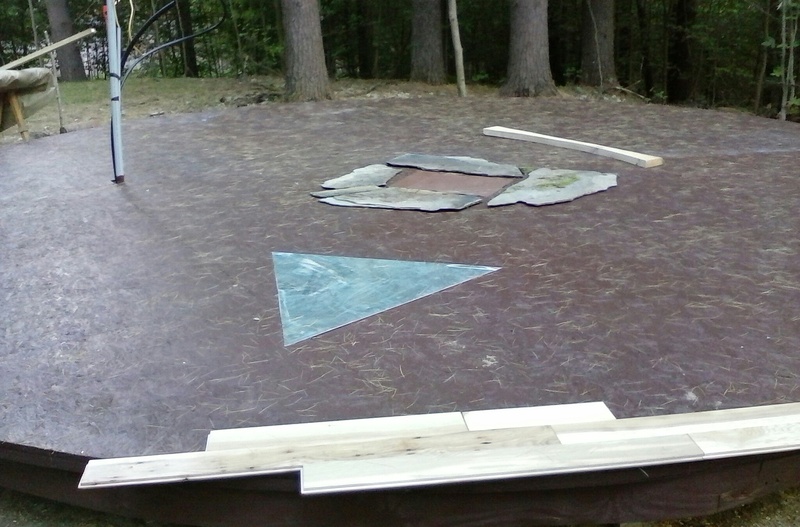 Once the cement dried, the deck construction started. 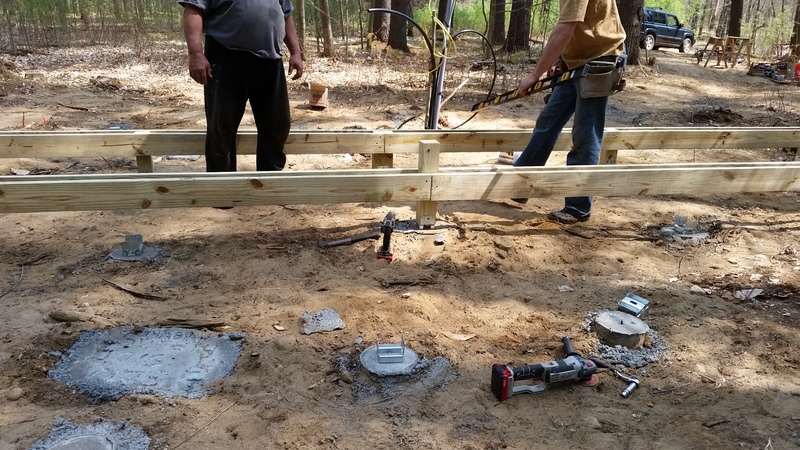 Steve and crew had to work around the plumbing and electrical lines, but they got it all set up without much of a problem. 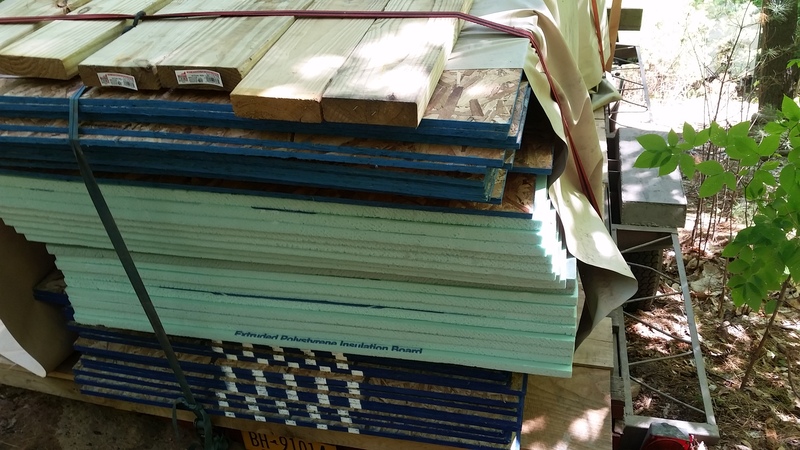 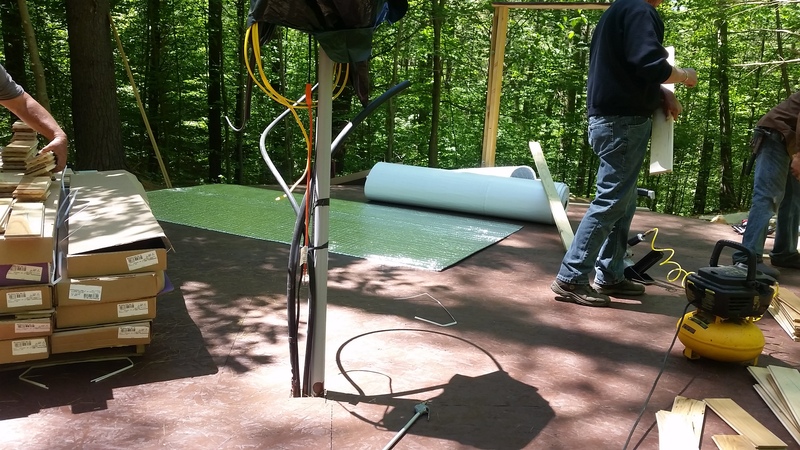 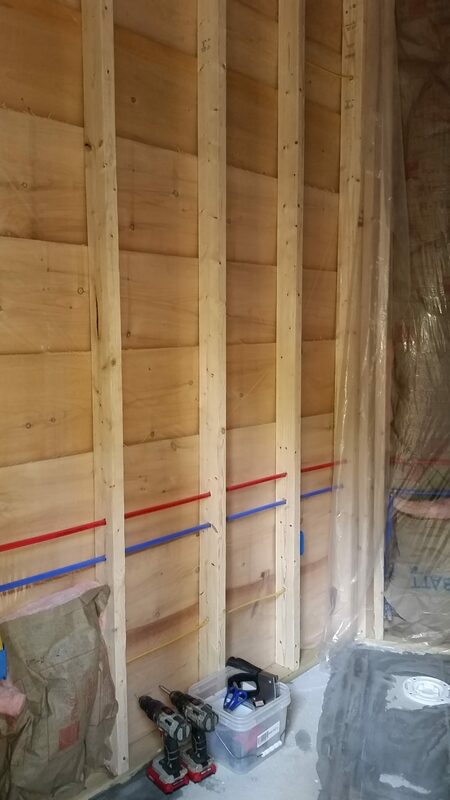 The deck is insulated thoroughly with foam board sandwiched between OSB. 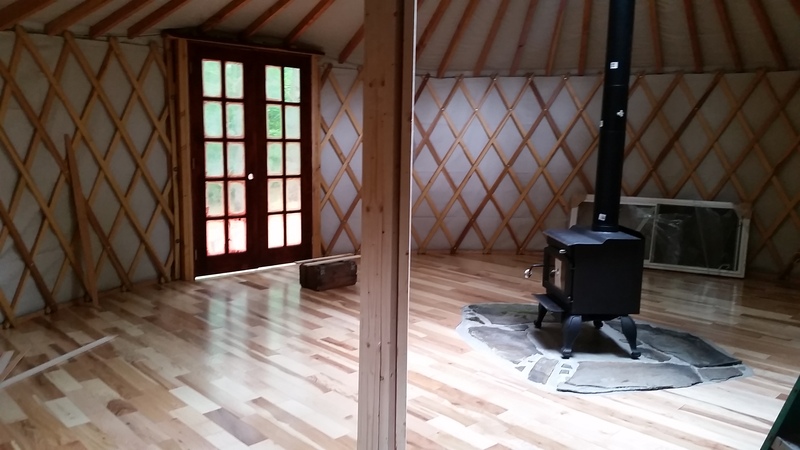 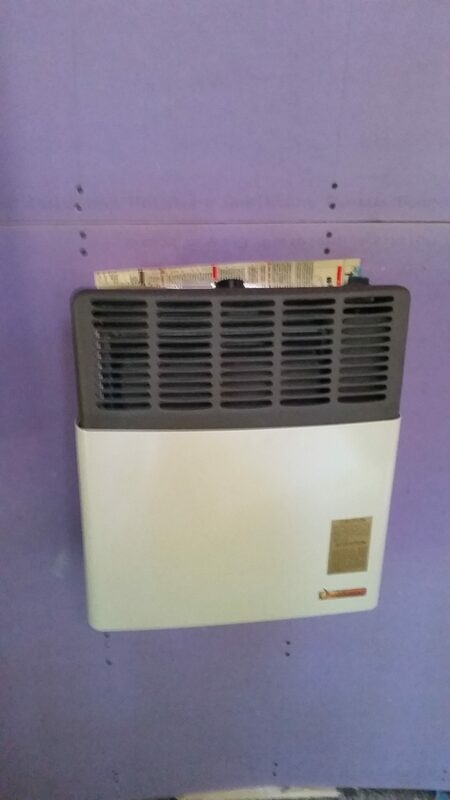 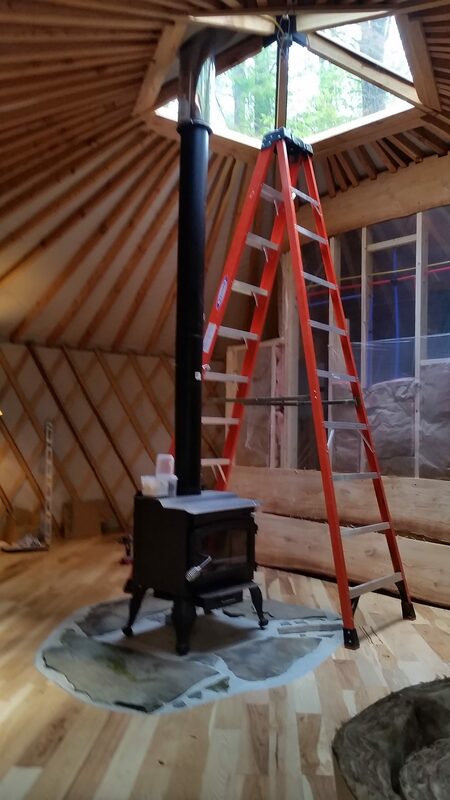 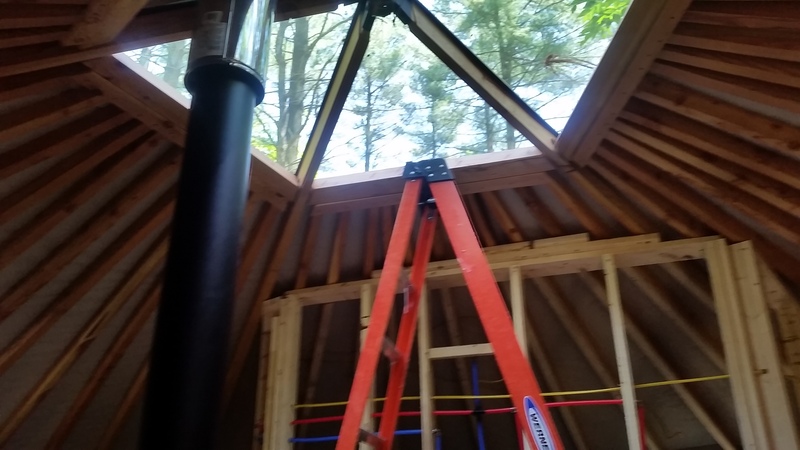 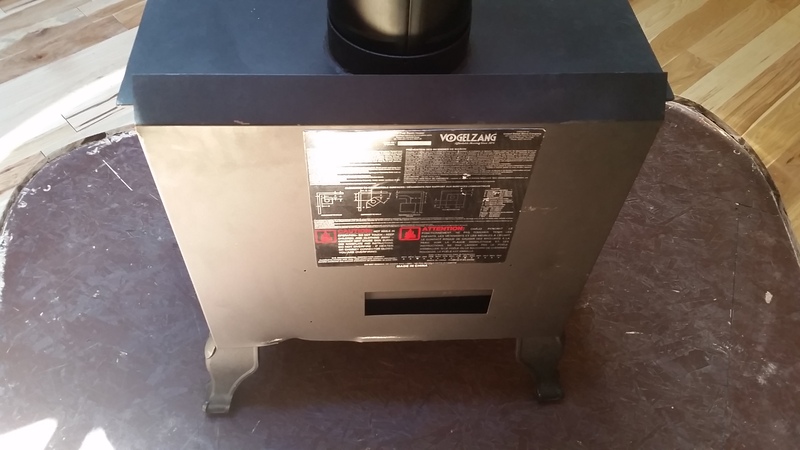 This will help keep the yurt warm during those cold North country winters. 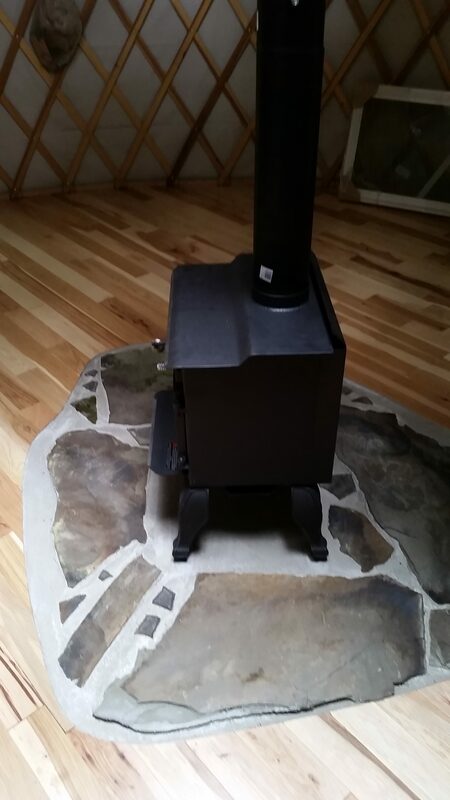 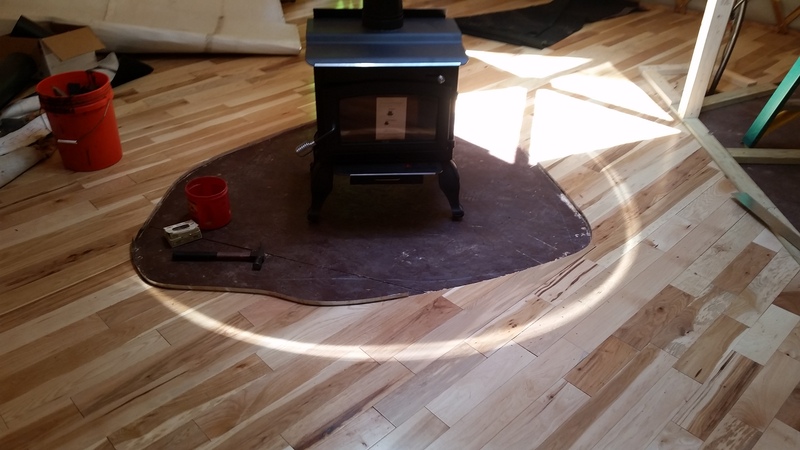 It also helps deaden the upcoming hickory hard wood flooring. 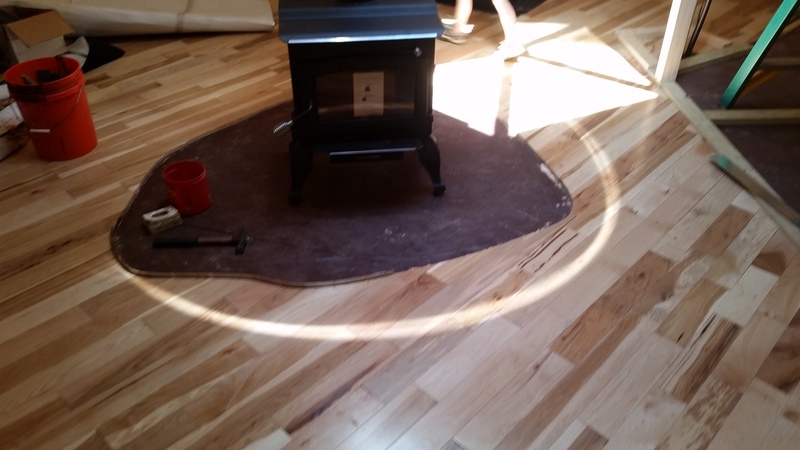 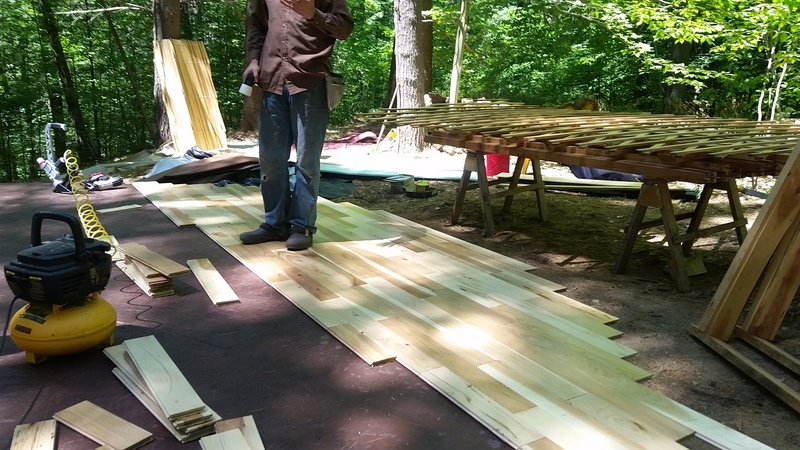 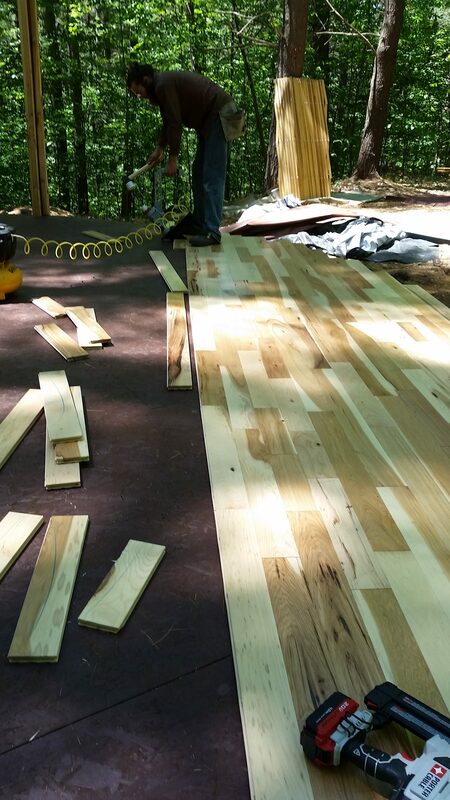 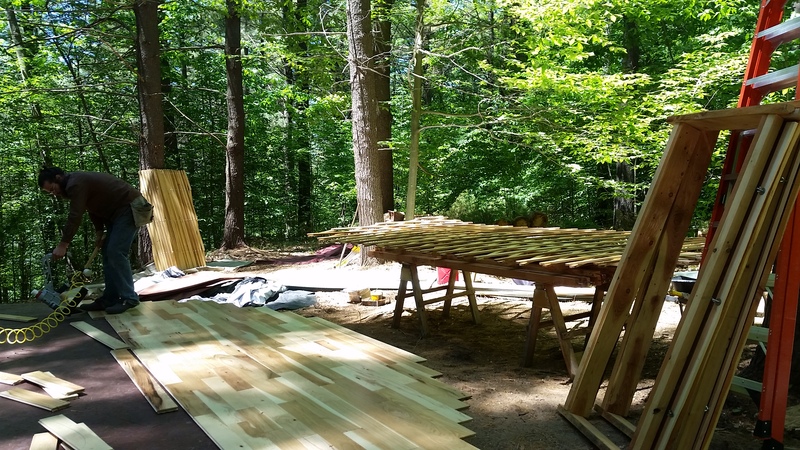 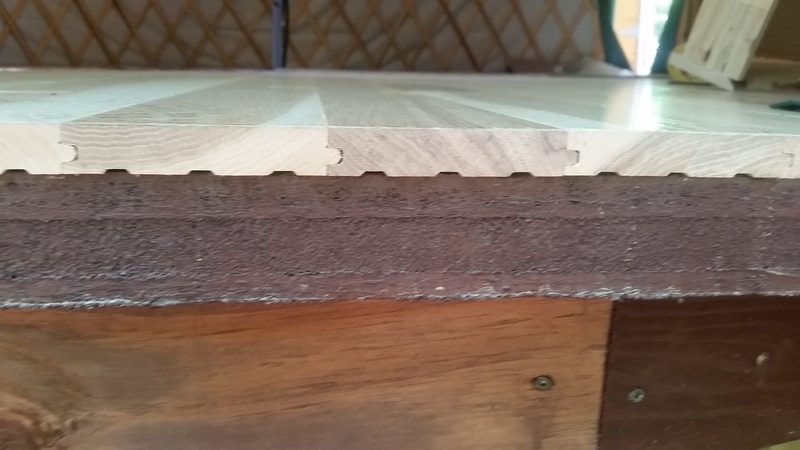 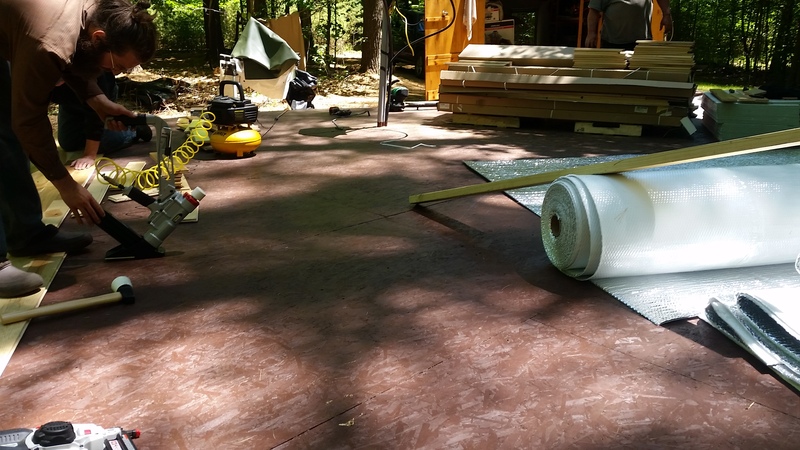 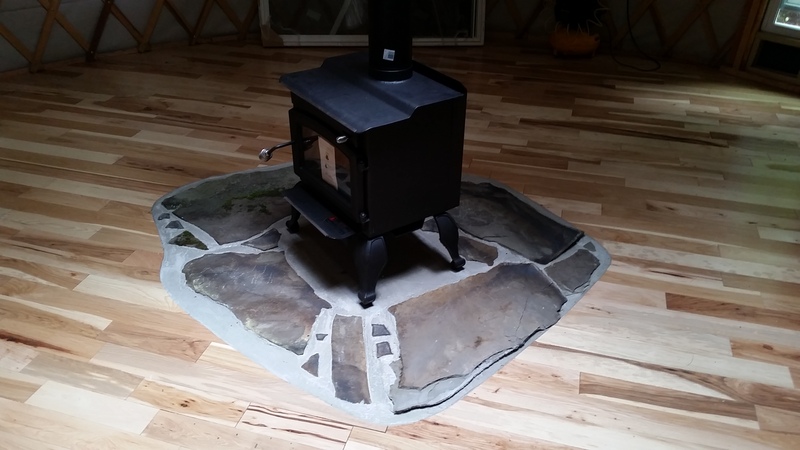 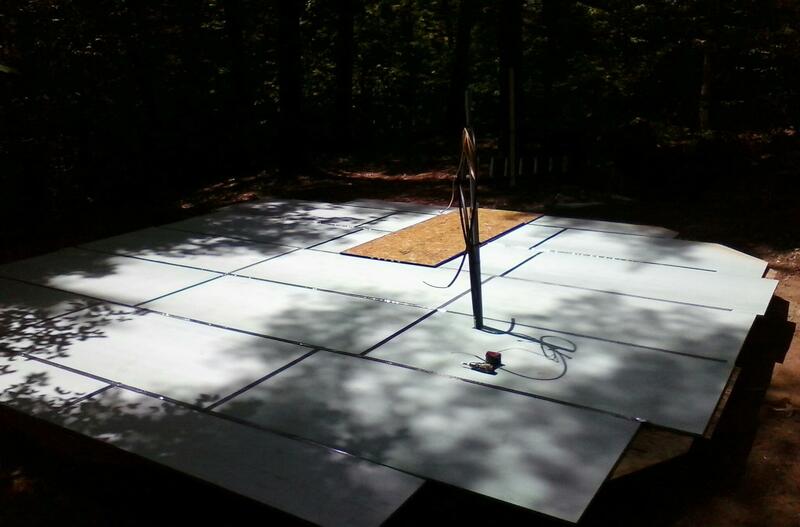 Before the yurt could go up, the hickory flooring was installed. 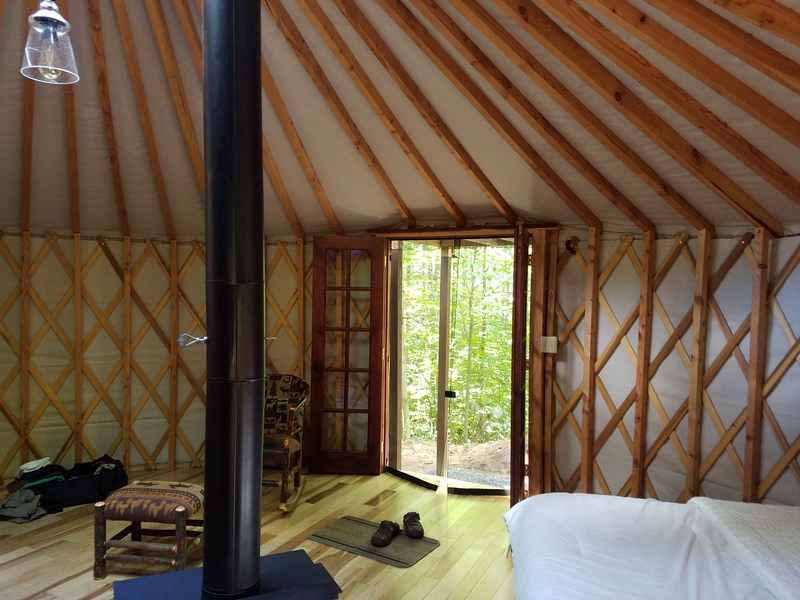 The rest went up like most yurts. 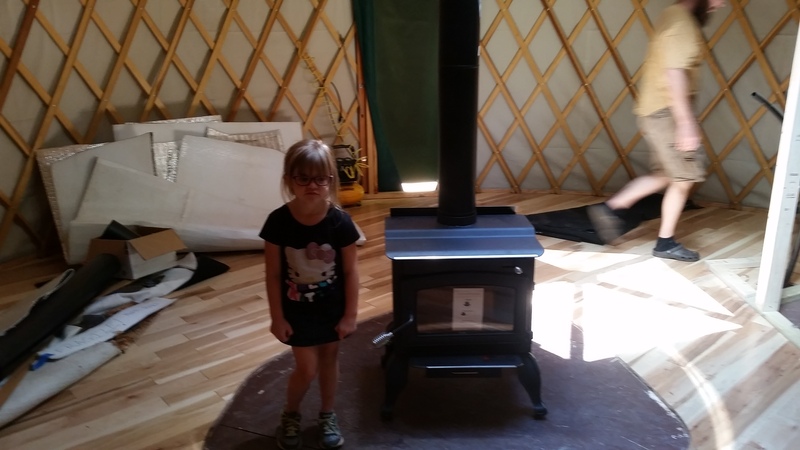 Here are some shots of the wood stove, custom hearth and one of my daughter Addy who came with me on this particular visit! 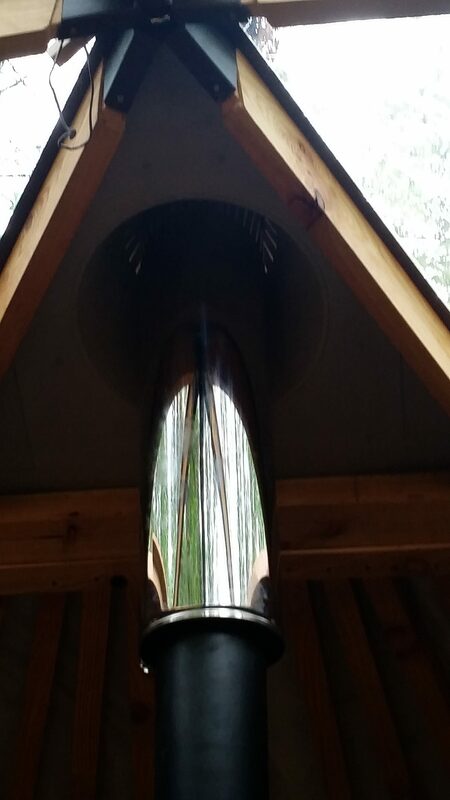 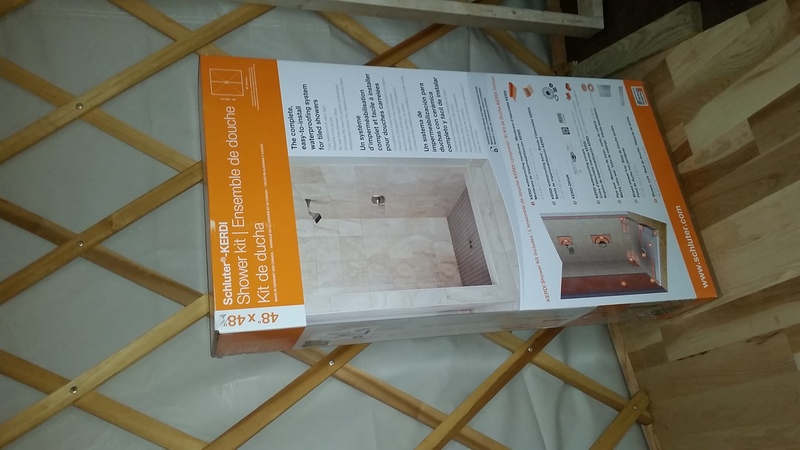 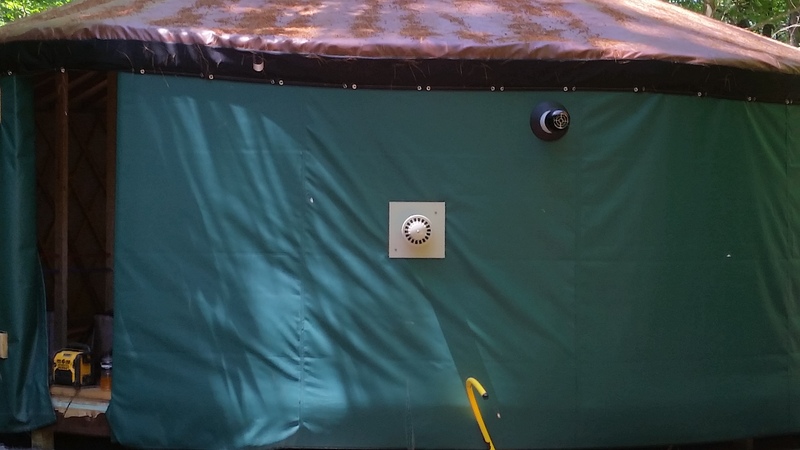 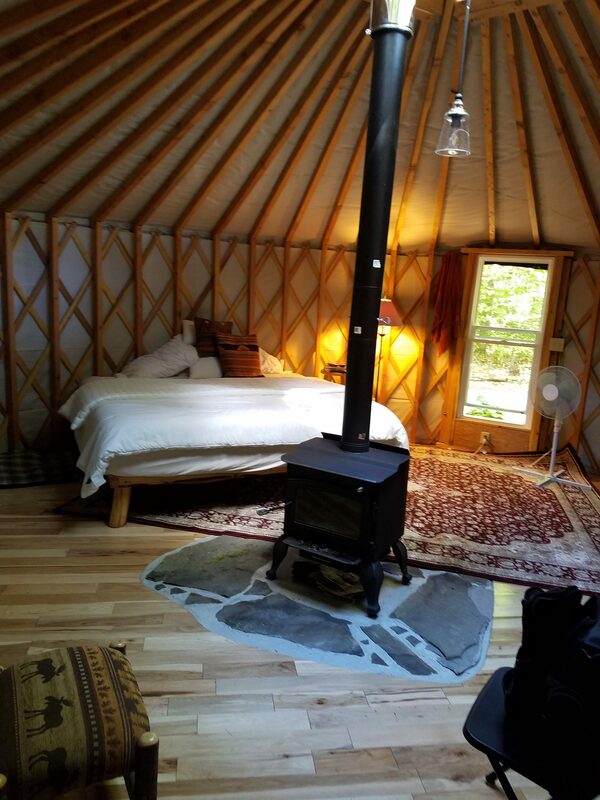 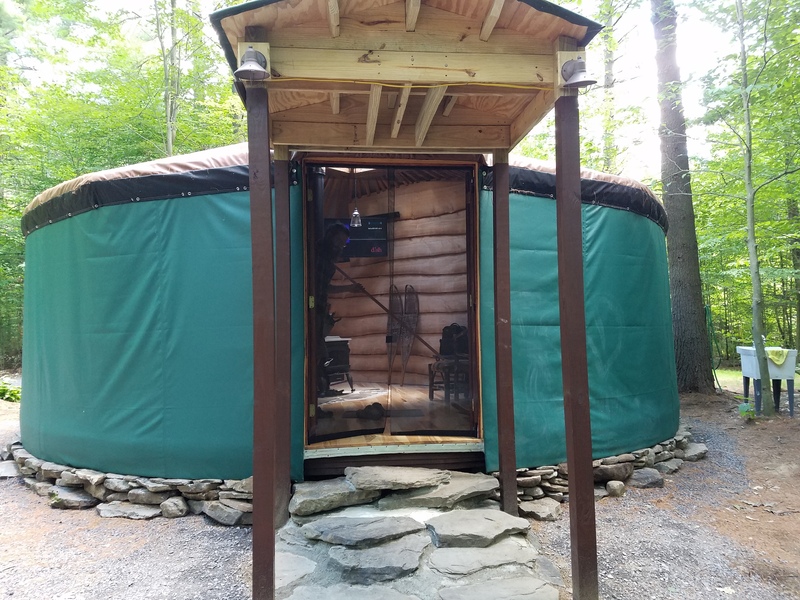 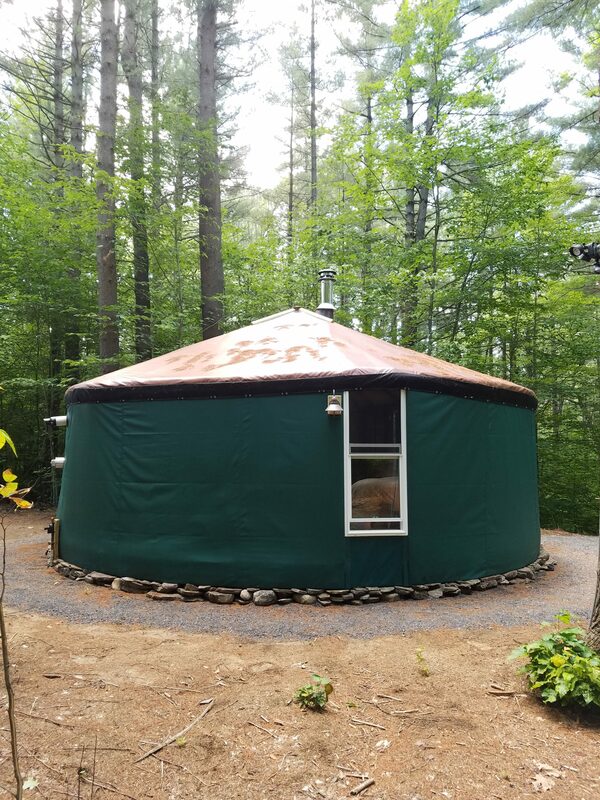 The big feature of this yurt is the enclosed bathroom with a slate shower, river rock base and tankless water heater. 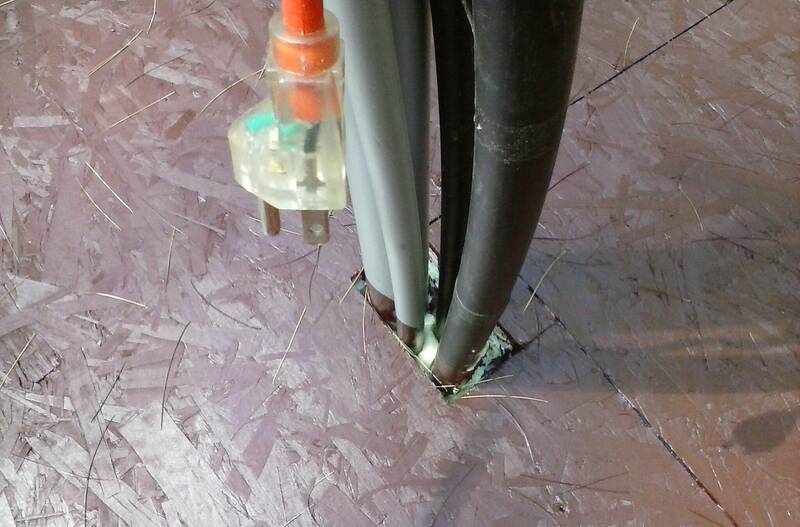 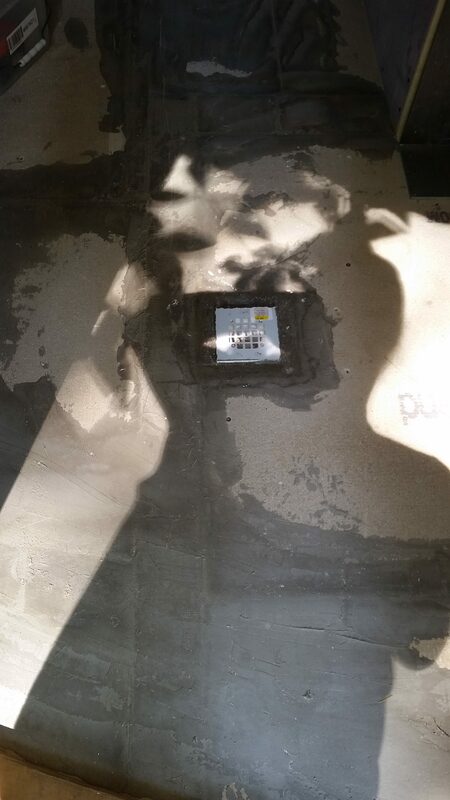 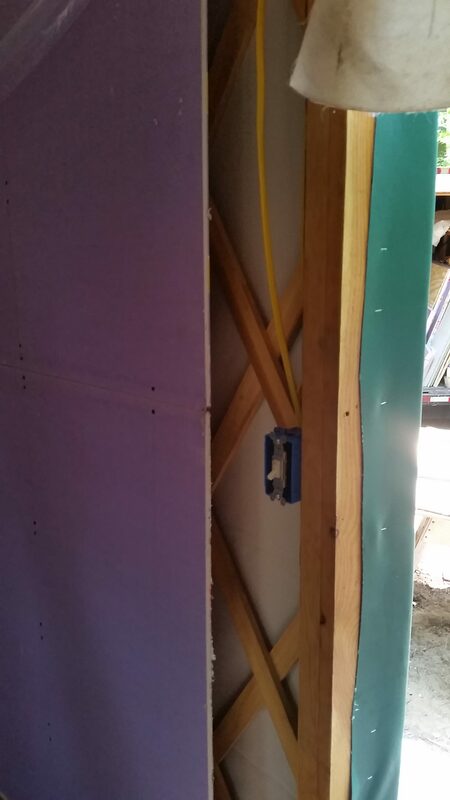 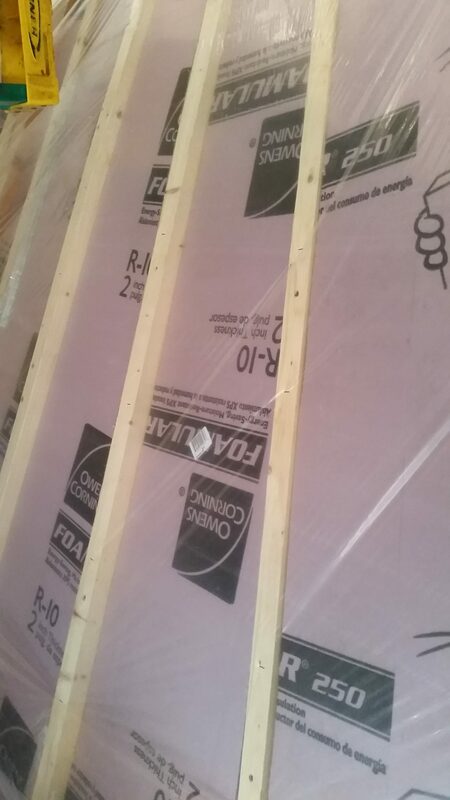 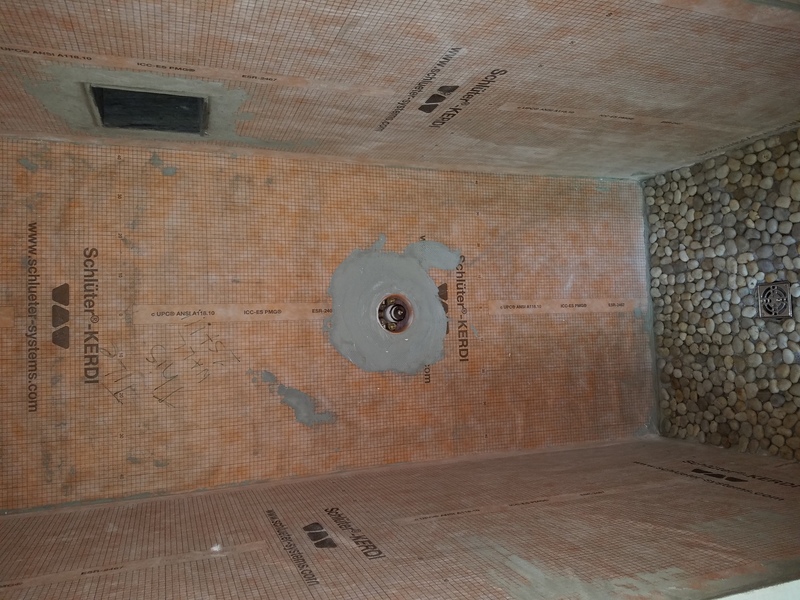 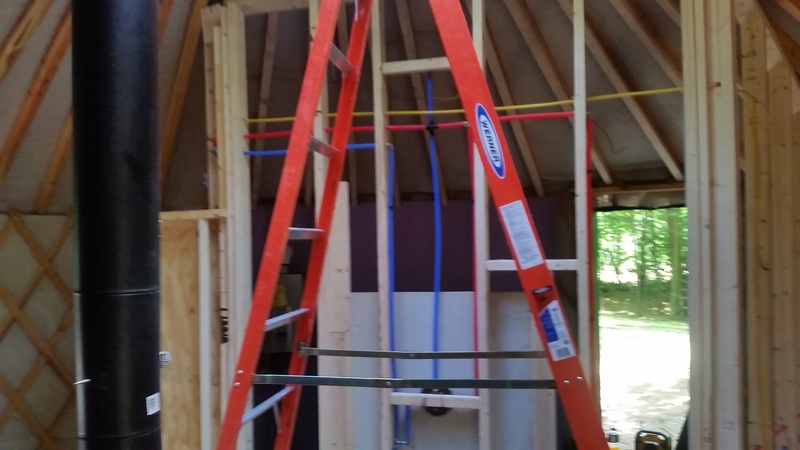 The water was piped in with Pex. 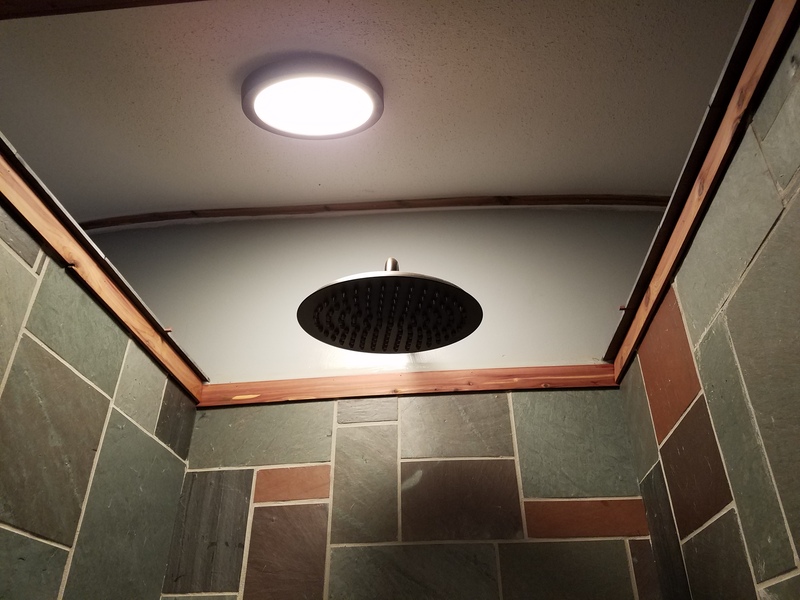 The rain shower head caps off this beautiful shower. 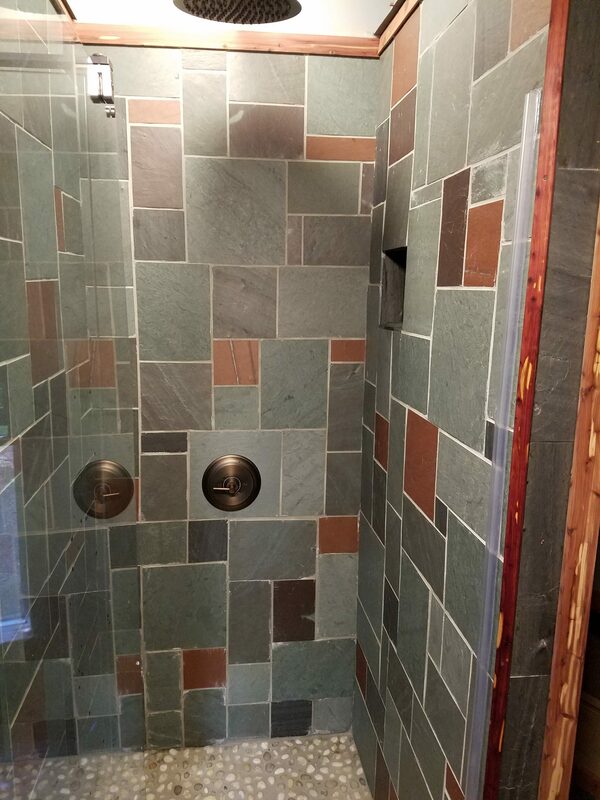 The green onyx sink was custom made and Steve made the base for it to sit in. 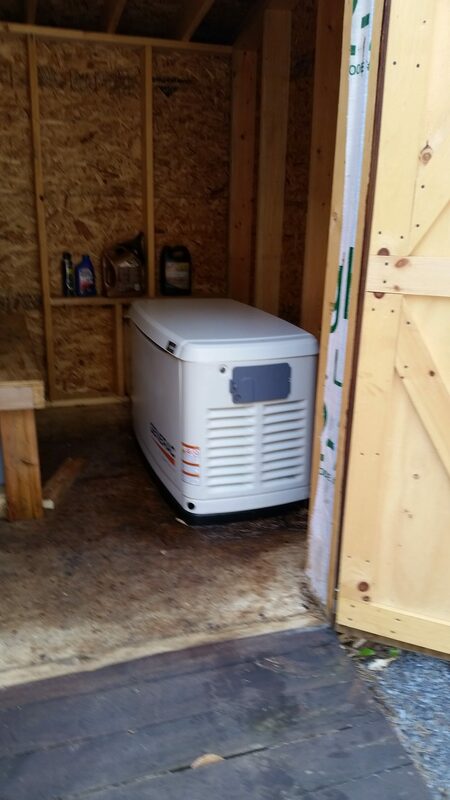 The bathroom is also heated by propane so as to keep the pipes from freezing. 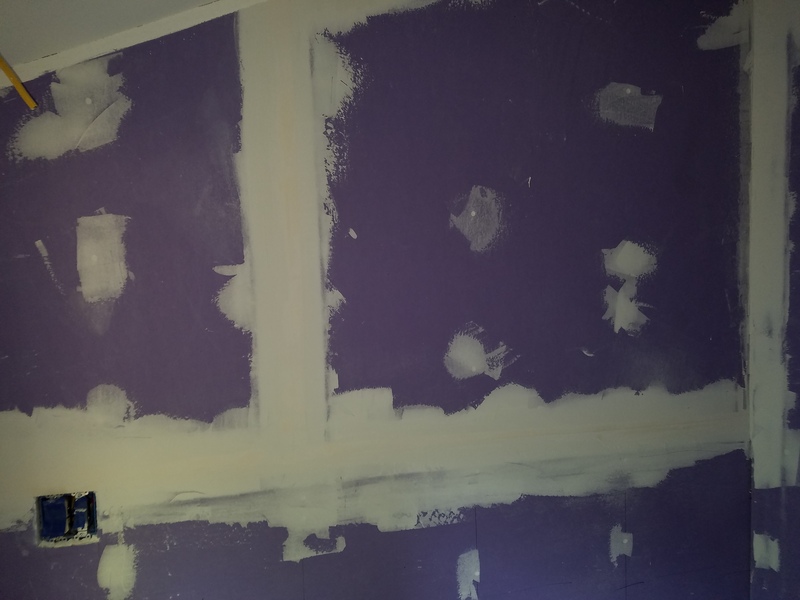 The last day I was at the project, it was pretty much all done. 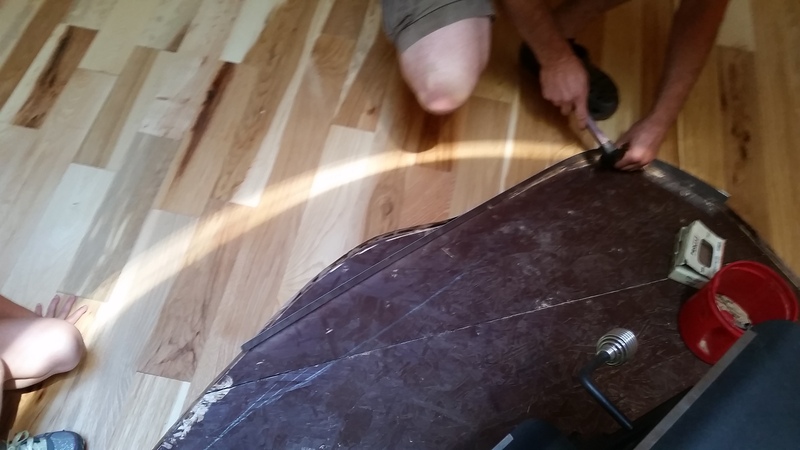 Steve was just touching up some of the trim work as I walked around taking pictures. 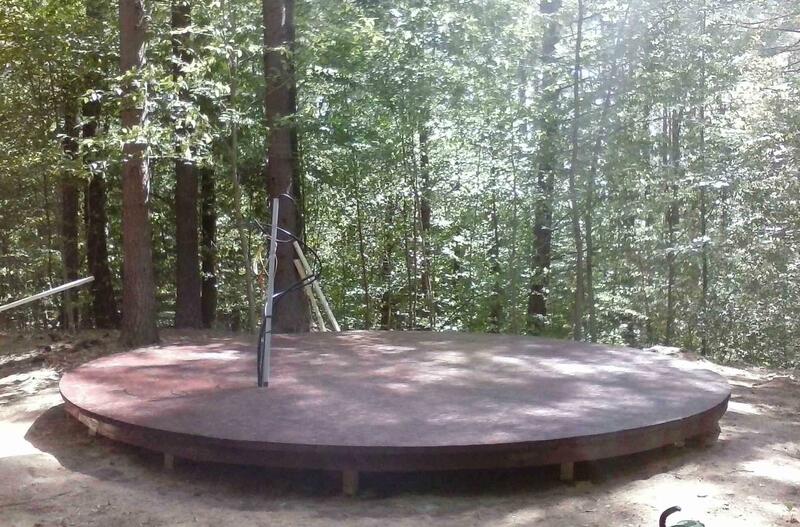 From foundation to finished, this project took almost the entire summer of 2016. 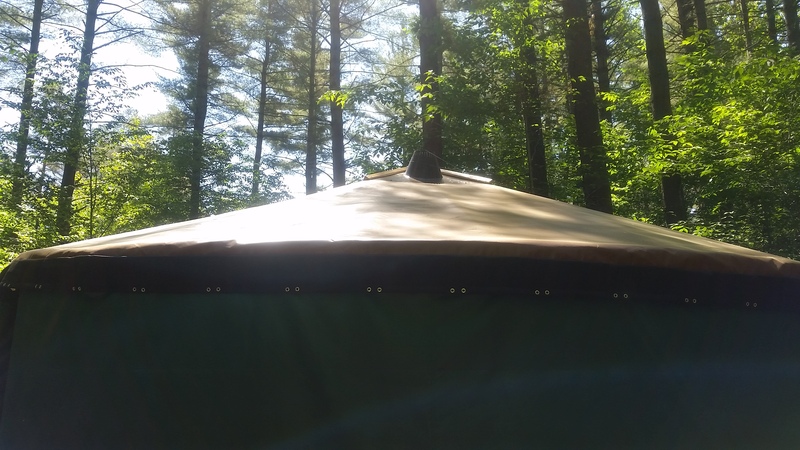 Surely Yurts usually puts up their yurts in a day or two but this required a great deal of custom work and I know Mike is proud of how it came out. 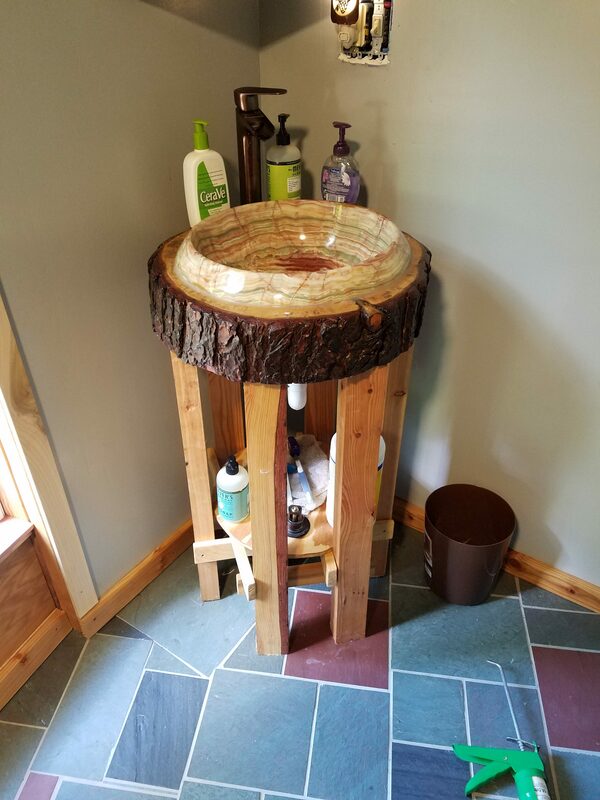 We will have to hear back from him soon to see how well it fares this winter!